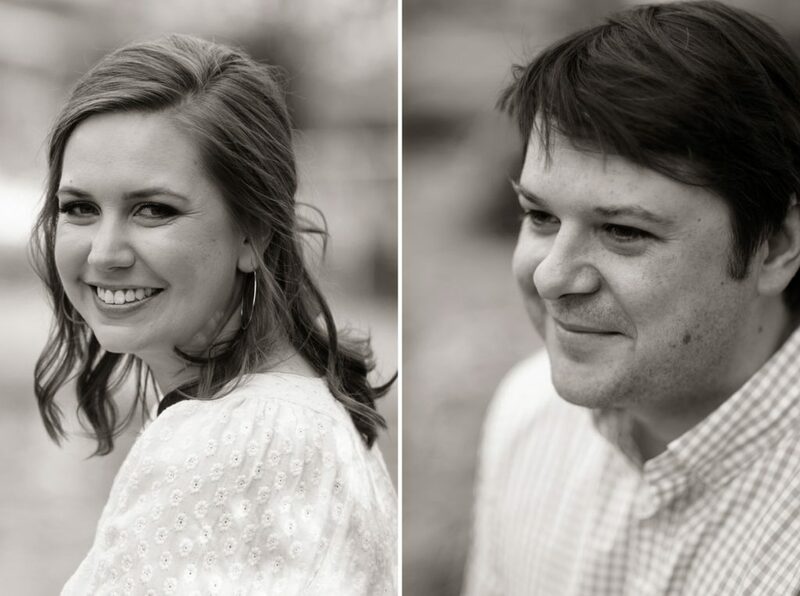 Sara Caitlyn and Andrew’s first date was at Thomas Street Tavern in Plaza-Midwood. It’s a spot I know well from my own early days with my husband, and I can picture them there, talking and getting to know one another’s quirks and histories, all of those initial little details that tell you whether this person is just another one, or THE one. 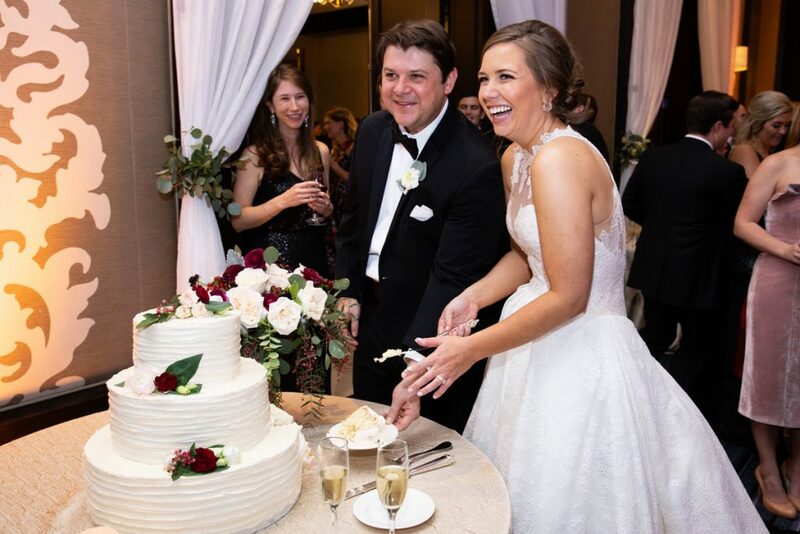 Their initial date led to another, and before too long Andrew was dropping to one knee in the kitchen on New Year’s Eve, giving Sara Caitlyn just the proposal she’d always wanted. 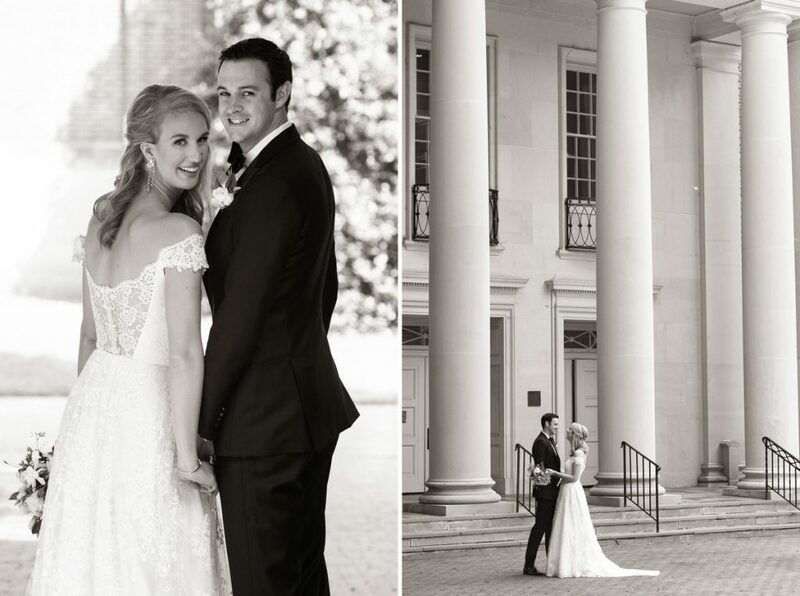 First Presbyterian Church is one of my favorite ceremony sites in town, so I was delighted when I heard that Sara Caitlyn and Andrew had chosen it for their wedding day. The tone they wanted to set for the event was simple and classy, and First Presbyterian fills the bill perfectly. Adding to the meaningfulness of the choice was the fact that Sara Caitlyn’s mother works at the church, so it’s been a part of her life for a long time. 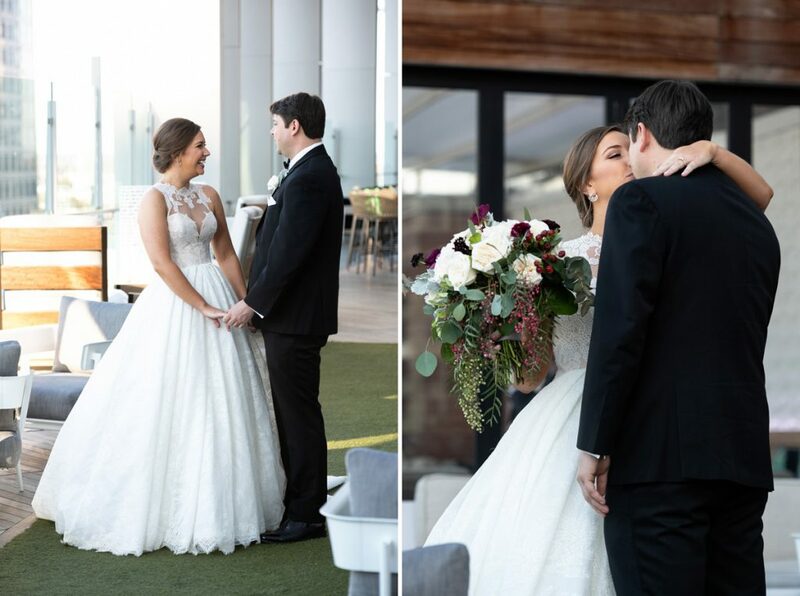 Before the ceremony, we had the first look on the patio of the new Merchant and Trade, situated on the rooftop of the Kimpton Tryon Park Hotel. 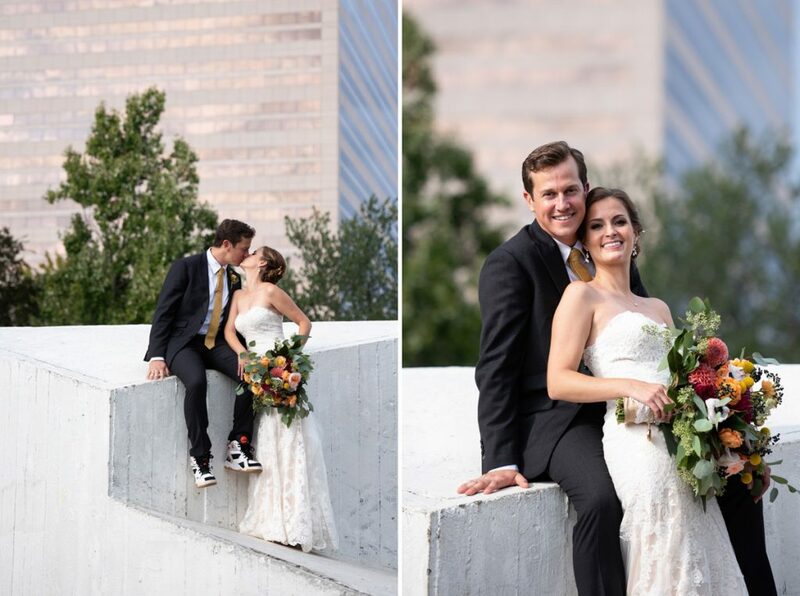 It was the perfect spot for that sweet moment between the bride and groom. 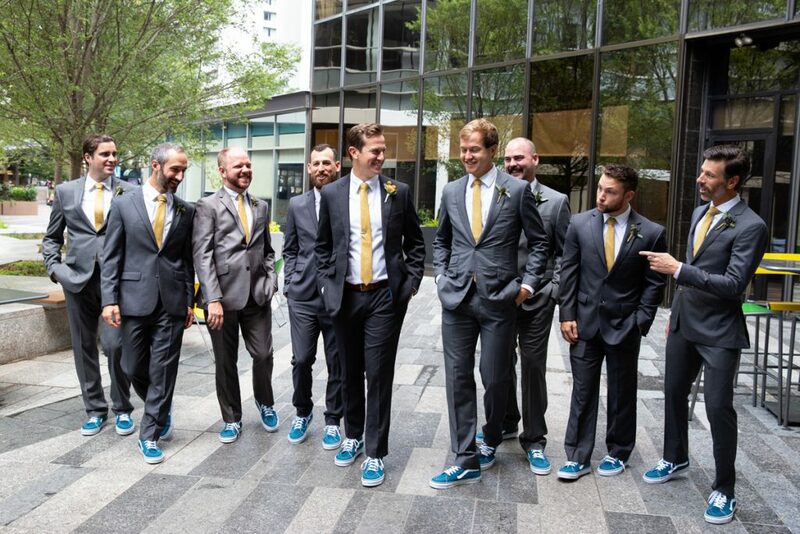 Then we headed down to Romare Bearden Park for pre-ceremony shots of the guys and girls. The fall had been dragging on and on, so there was still a touch of color on the trees. From there, we returned to First Presbyterian and knocked out all of the family portraits. 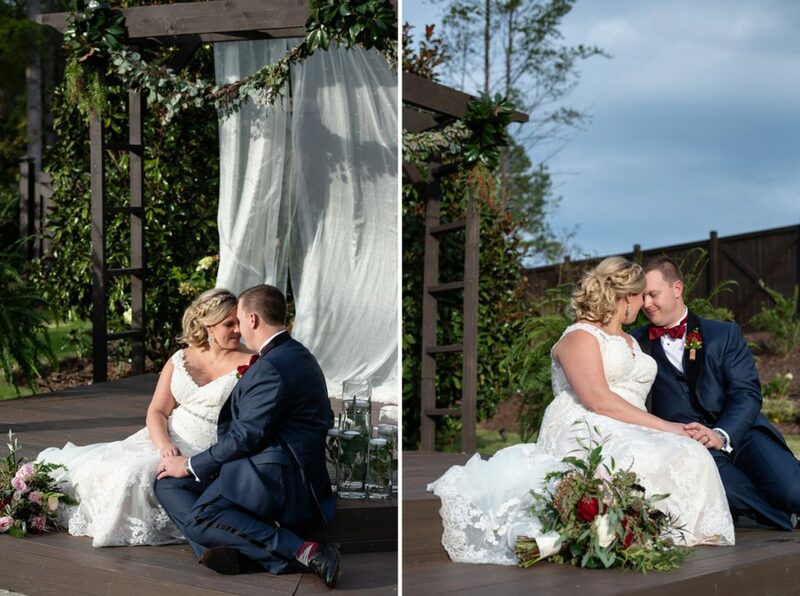 It was a fantastic choice for an autumn bride; it gets dark quite early in the late fall, and taking care of all the family shots prior to the ceremony really loosened up the schedule and gave us that exceptional late afternoon light. 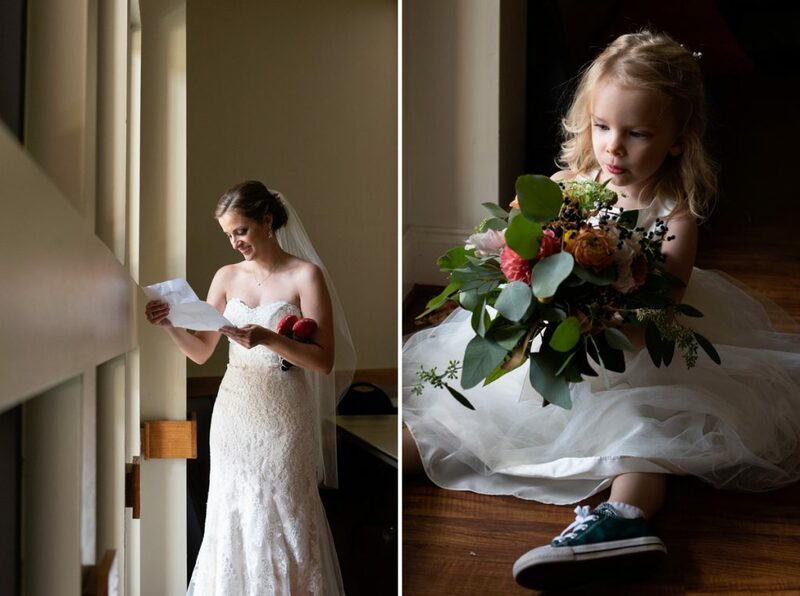 I am particularly fond of the moments captured between Sara Caitlyn, Andrew, and their grandparents. 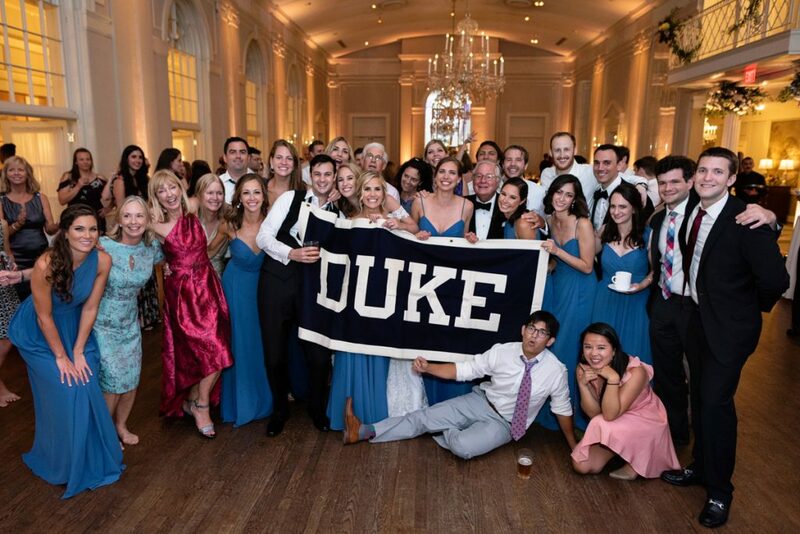 The bride and groom were so lucky to have some of them by their side on their big day. I haven’t had the blessing of grandparents in my life for some time now so, if a couple is blessed by the presence of theirs on the wedding day, you better believe I am going to make sure to get some unforgettable images of them together. 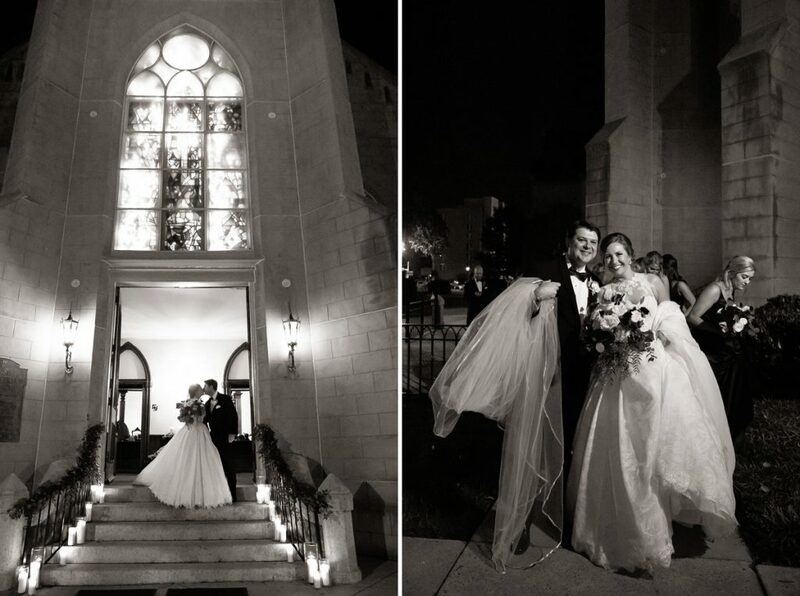 After a lovely ceremony, I captured some charming shots of Sara Caitlyn and Andrew exiting the oversized wooden front doors of the church and down the candle-lit front steps. There’s an image of them sharing a kiss that is straight out of a storybook. 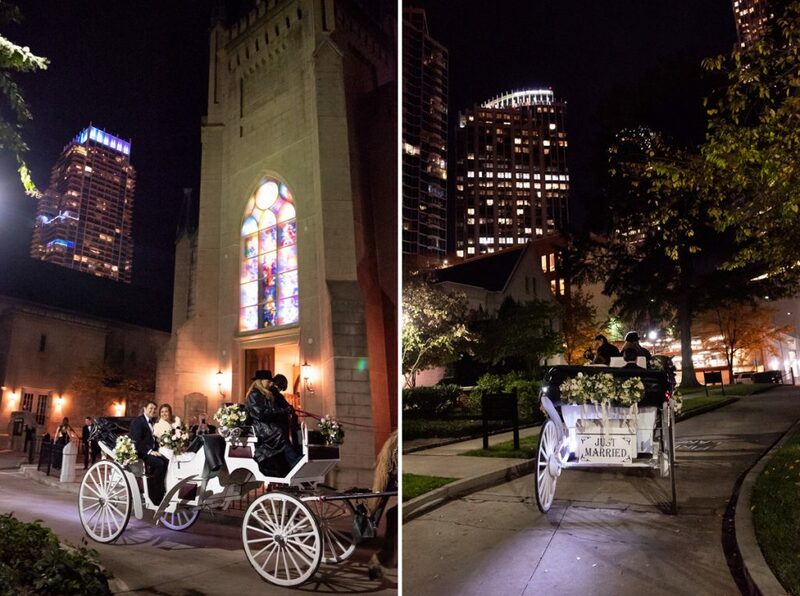 After a handful of additional portraits at the church, the newlyweds climbed into a horse-drawn carriage, enjoyed a lap around the Queen City, and then headed for the reception. 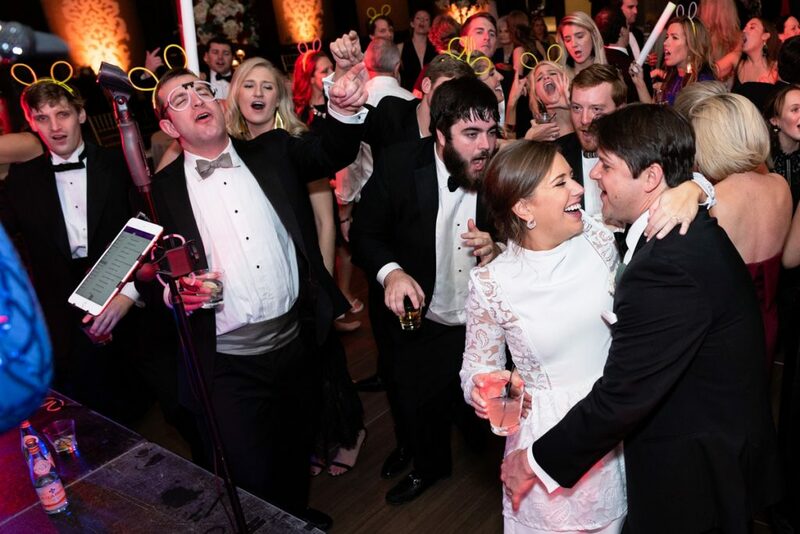 The reception took place at the Kimpton Tryon Park Hotel, one of the newest venues in town. 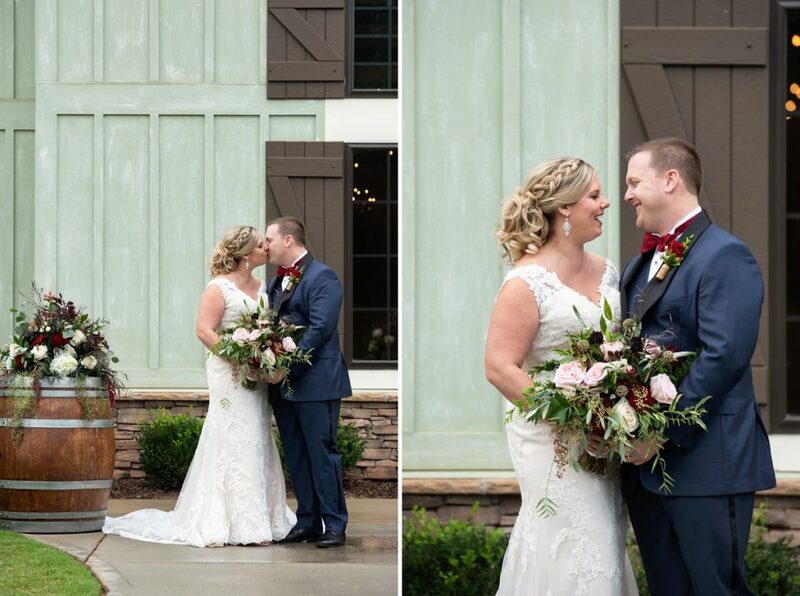 I’ve been working with them since before the hotel opened, and with their absolutely beautiful building and commitment to customer care, it was an ideal choice for Sara Caitlyn and Andrew. 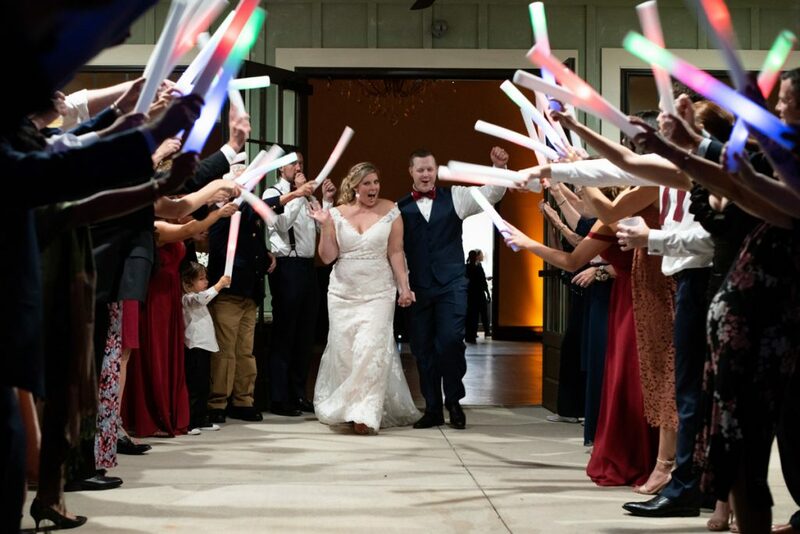 When they arrived, the bride and groom headed to a private room to have a bite to eat. Their time together was briefly interrupted when Sara Caitlyn’s grandparents, Fritz and Nancilynn (who have been married for over 50 years!!) presented them with Nancilynn’s “world famous” coconut cake, complete with the lace bell cake topper from their own wedding decades before. It was such a precious moment to witness, and the cake was heavenly. 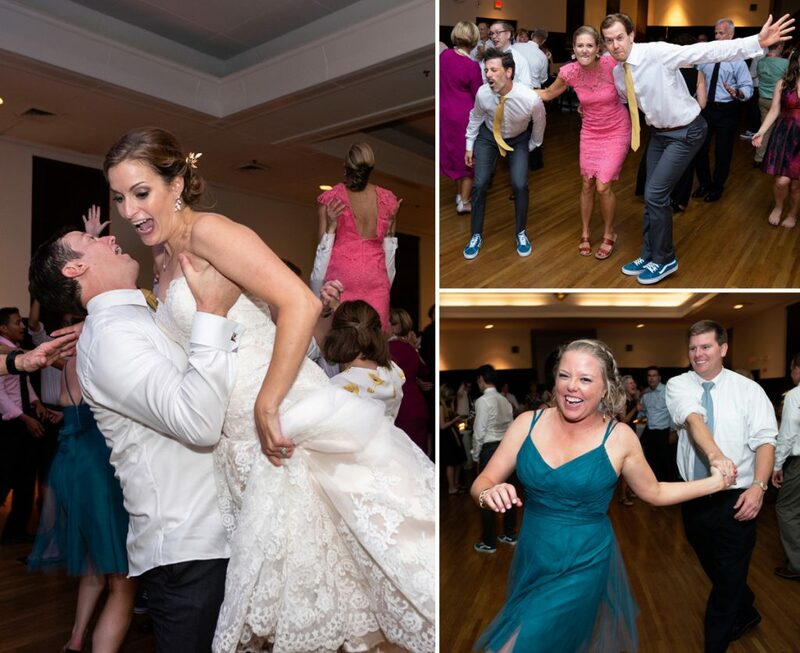 Once the bride and groom made their grand entrance into the ballroom, the party really got going. Their band, Right to Party, kept things hopping all night. When the festivities eventually drew to a close, Sara Caitlyn and Andrew made a bubble exit—the result of a bubble machine and bubbles of the more traditional mouth-blown variety—down the beautiful glass stairs into the lobby of the hotel and headed off into their new lives. For their honeymoon, these two lovebirds headed to Antigua, where they had no particular agenda save for maximum relaxation and decompression. 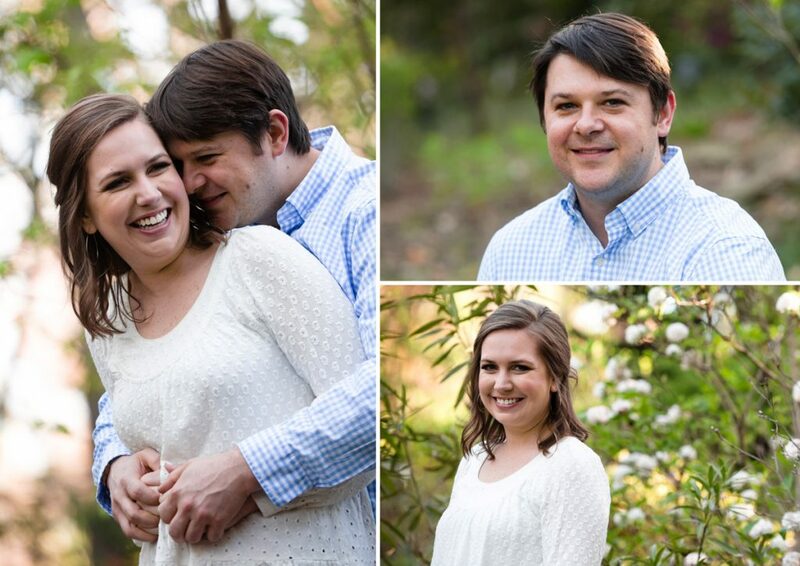 So happy for Sara Caitlyn and Andrew–such a well-matched pair. It was an absolutely perfect night, and I feel so fortunate to have been a part of it. 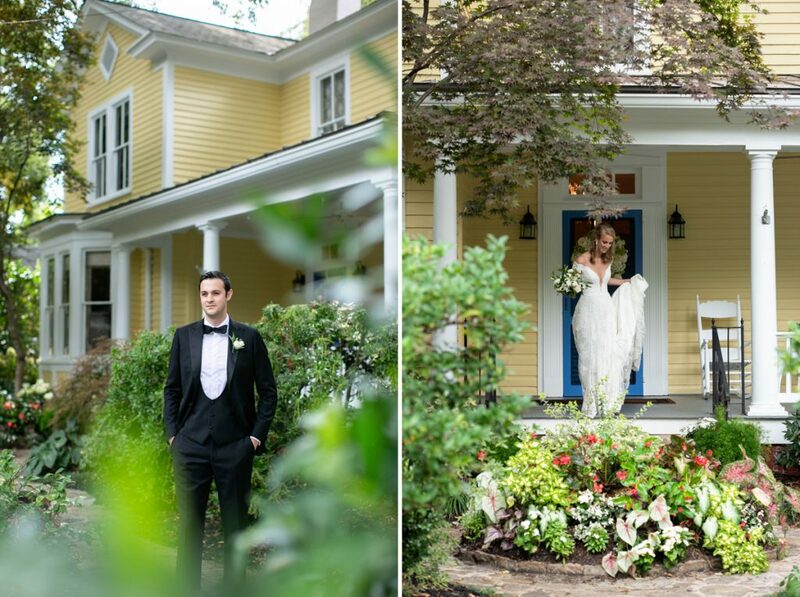 Thanks to Emily of Emily Renee Photography for her beautiful images. I always LOVE working with you! 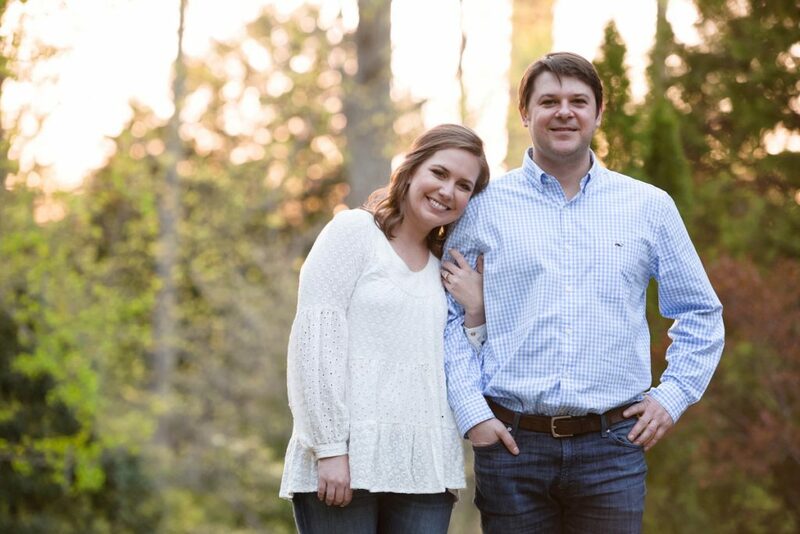 Be sure to check out Sara Caitlyn and Andrew’s engagement session at one of my favorite hidden gems in Charlotte, the UNCC Botanical Gardens. Deb and Brett met in the crazy world of online dating. Both of them had recently exited less-than-fantastic relationships and they were just looking to get themselves back out there. 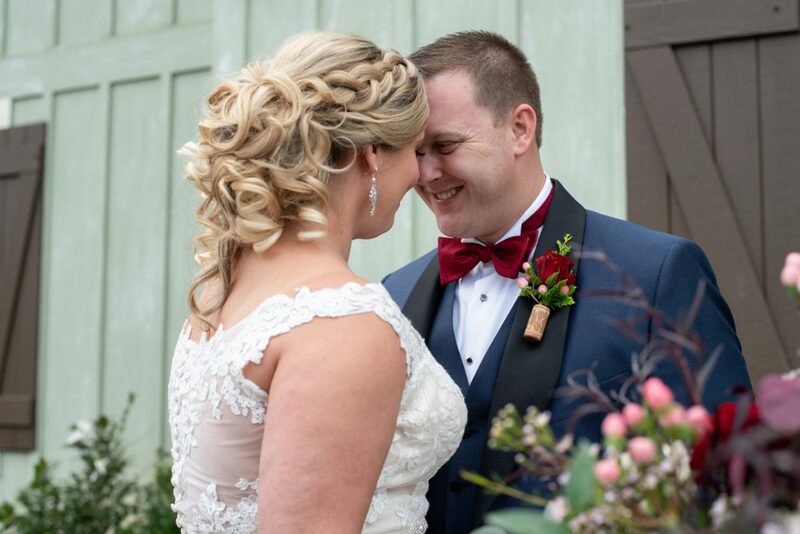 For their first date, they met at Duckworth’s Sports Bar and Grill, and the connection was immediate. They were open and honest, and both of them just put it all out there for the other to absorb. During a family trip to Michigan a couple of summers ago, Brett popped the question using a green Ring-Pop. Don’t worry, he had the real deal sitting in his pocket and quickly substituted it for the equally sweet candy version. In planning the wedding, Deb and Brett knew that what they really wanted to accentuate were the people coming to celebrate their union, and the food and wine. These are two people who really love to experience life as fully as they can, and the culinary arts are near and dear to their hearts. Because of this, Deb and Brett were VERY interested in finding a venue that would allow them to use their own caterer of choice. As it happened, a brand new spot was just opening up in Cornelius, about two miles down the road from where they lived. 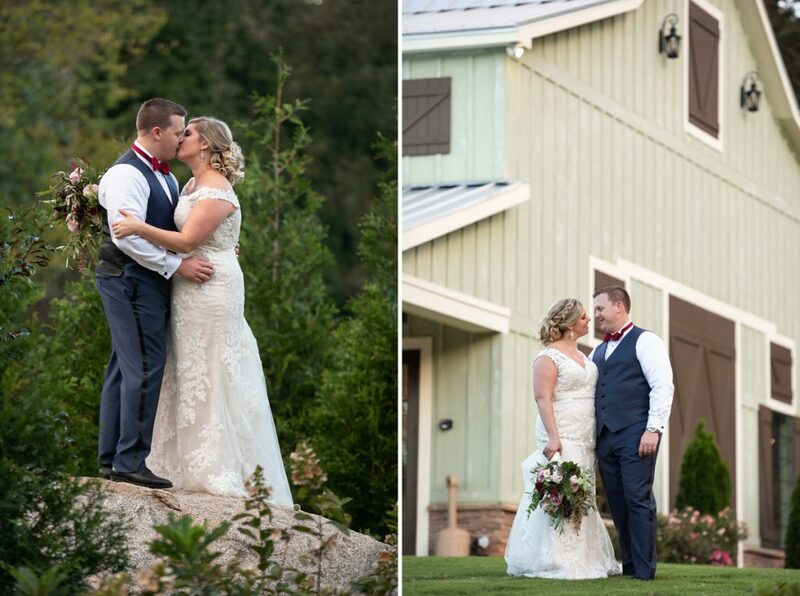 It was called Sweet Magnolia Estates, and it offered pretty much everything Deb and Brett were looking for, not only for their reception but also for their ceremony. 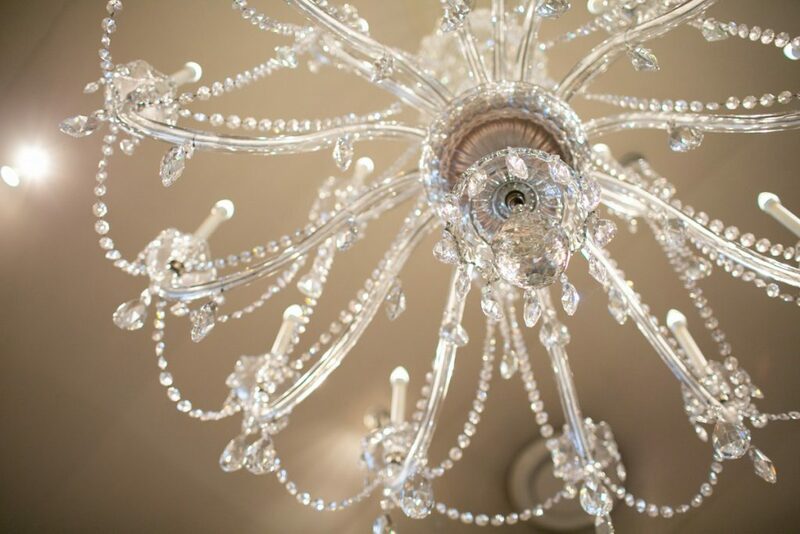 Sweet Magnolia Estates offers a variety of beautiful spaces for shooting. The getting ready rooms for both the bride and groom were lovely and functional, and the grounds are lush and well cared for. 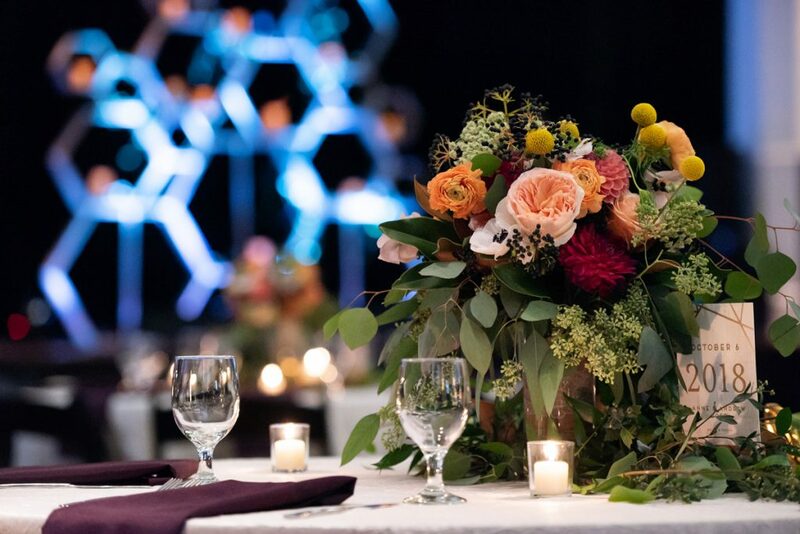 Add to the natural beauty of the surroundings the amazing floral contribution of Just Dandy Designs, and you have a knockout wedding site. Really, it was the flowers by Just Dandy that really set the tone for the day as much as anything else. 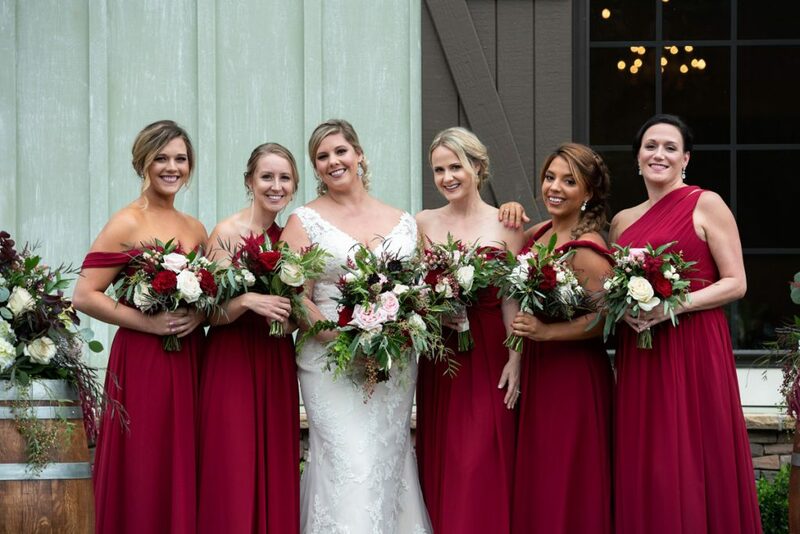 The flowers were absolutely gorgeous, from the wine cork boutonnieres to the bouquets and centerpieces. 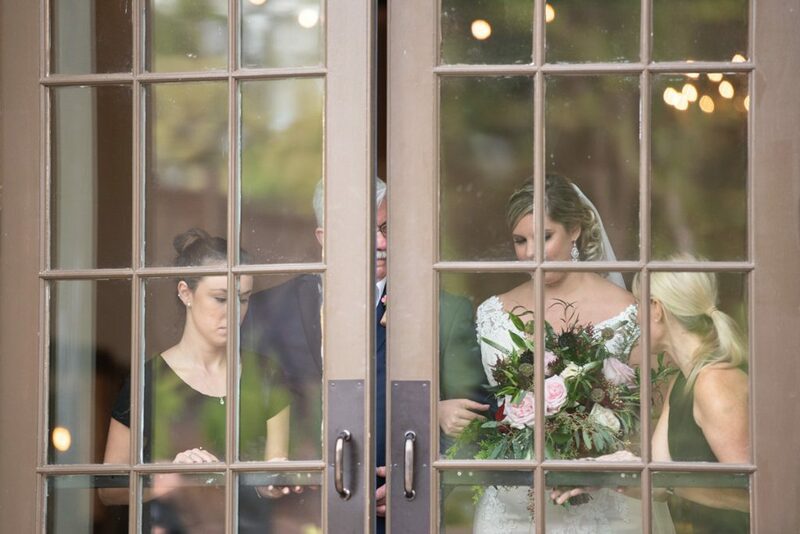 After getting ready, the bride and groom had a charming first look by the entrance to the ceremony site. 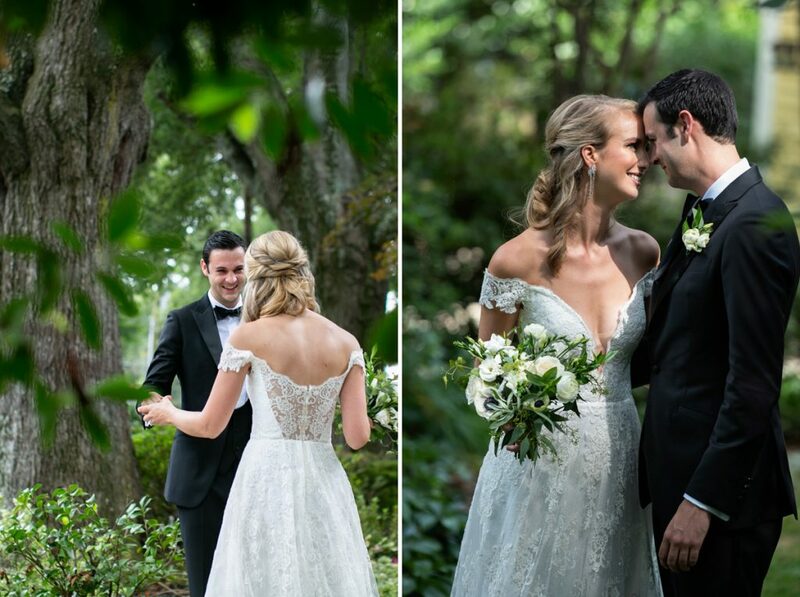 I absolutely LOVE first looks and these two did not disappoint–so much sweetness! 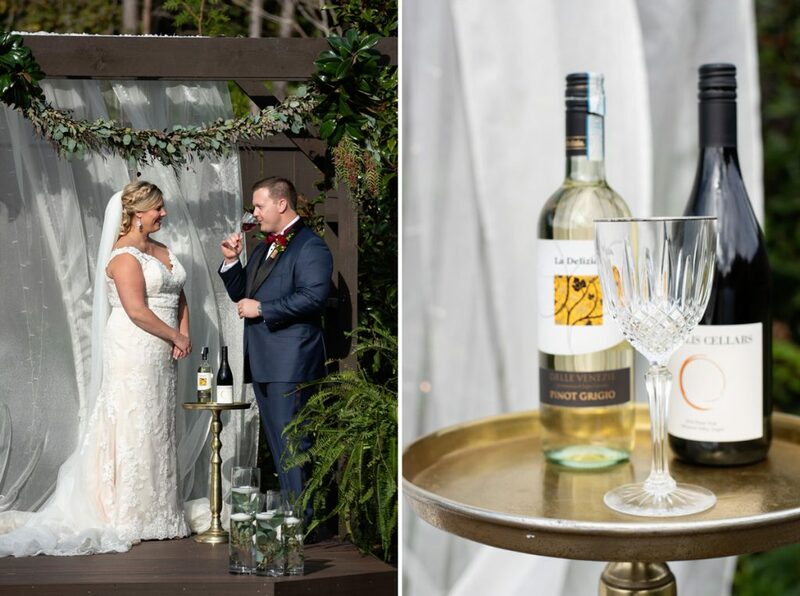 The highlight of the wedding itself (other than the “I dos,” of course) was the wine ceremony during which Deb and Brett mixed a pinot noir with a pinot grigio as a symbol of unity. 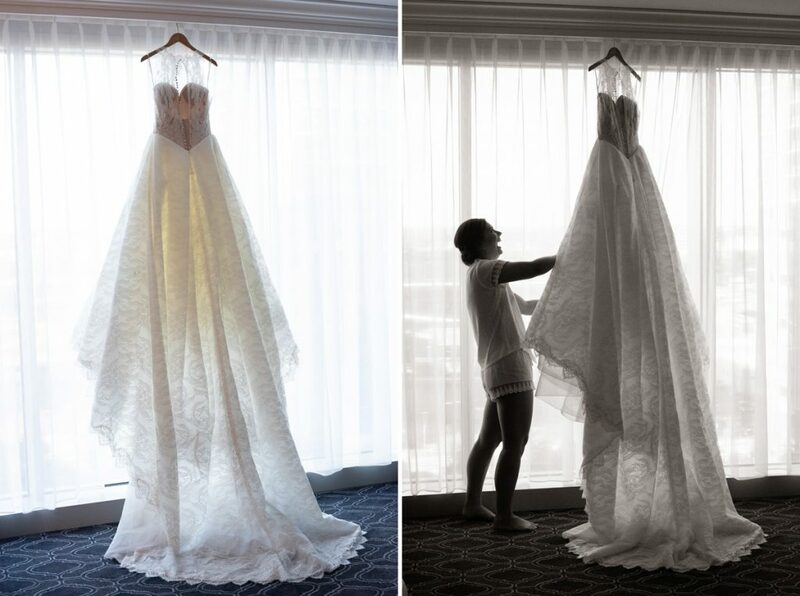 I’d never seen that before, and it was such a lovely personal moment for the bride and groom. And after the ceremony? Well, the party of course! Deb and Brett started things off by making a point to take part in their cocktail hour. 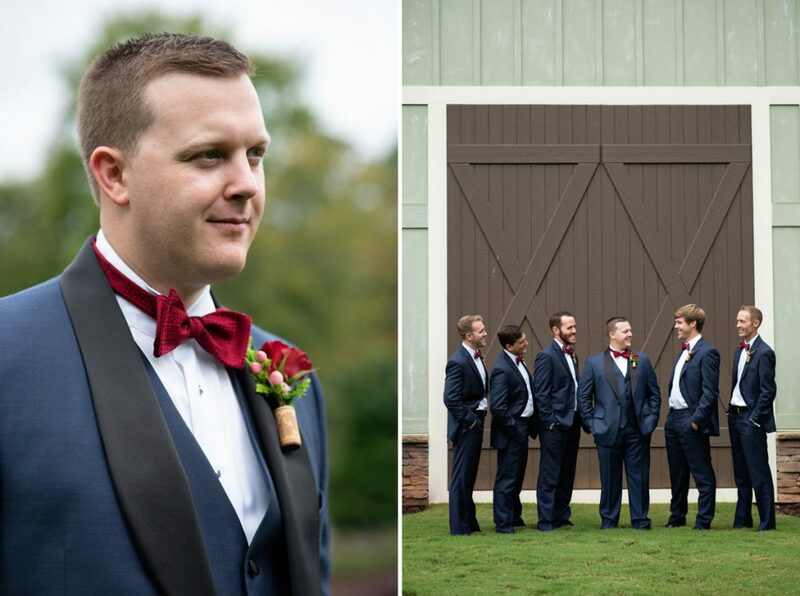 We handled almost all of their formal photography before the ceremony in order to make this happen. 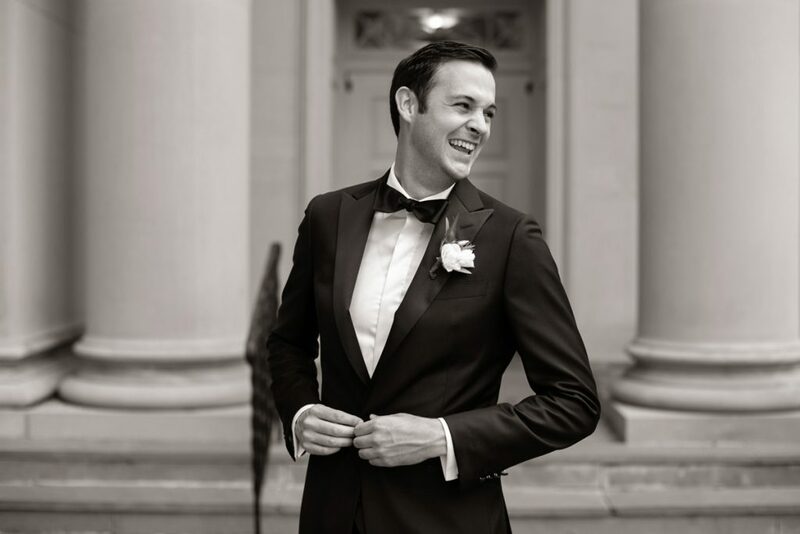 Not enough brides and grooms get to experience that post-wedding moment. I love that they were there. From here, the party really got rolling. The music was provided by Split Second Sound, and the DJ kept things moving all night. The delicious spread was created by Family Catering, and they handled everything from dinner to dessert. One of my favorite details was the gigantic charcuterie display in the reception hall. I don’t think I’ve ever seen so much scrumptious meat and cheese in one place. 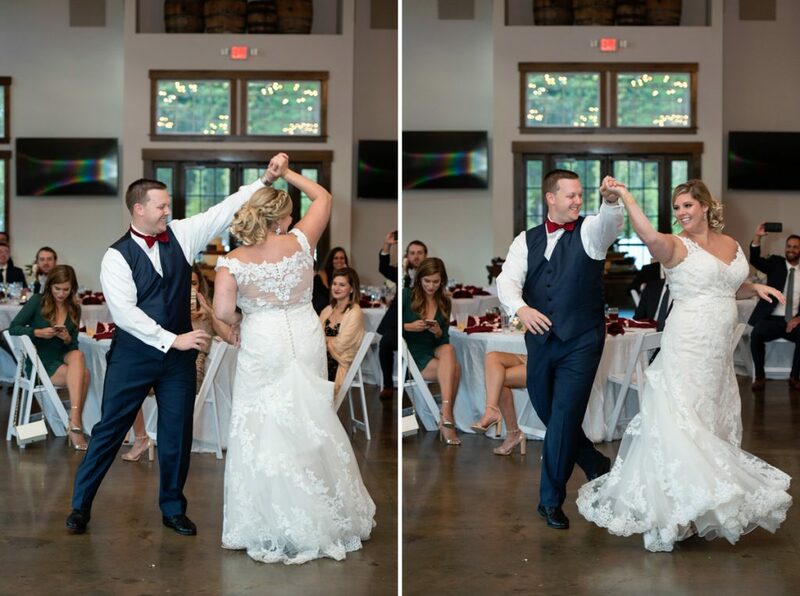 When Deb and Brett had their first dance, it was to a montage from The Greatest Showman. The whole thing was so delightful and romantic. And I’ll tell you, one the things I really love is how Deb and Brett planned their honeymoon. Pretty genius. They knew they were going to travel through Spain, Italy, and France, so on their wedding registry, they gave guests the opportunity to gift experiences along the way. Tapas in Spain, a wine tasting in Italy, truffle hunting in France… For almost three weeks, these two ate and drank their way through the yummiest parts of Europe. I can barely hide my jealousy. 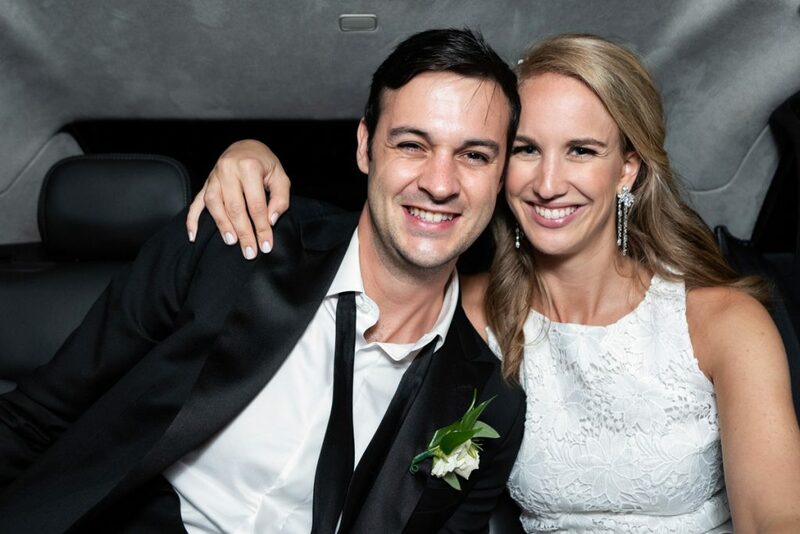 Deb and Brett, so delighted that I had the chance to be with you two on your wedding day. I hope married life has been amazing so far, and I can’t wait to hear about all the wonderful things coming your way. I’m going to keep stalking you two cuties on social media–I can’t get enough of those adorable pics of your new puppy! Thanks to Christina of The Shutter Owl for her beautiful images. I loved working with you! 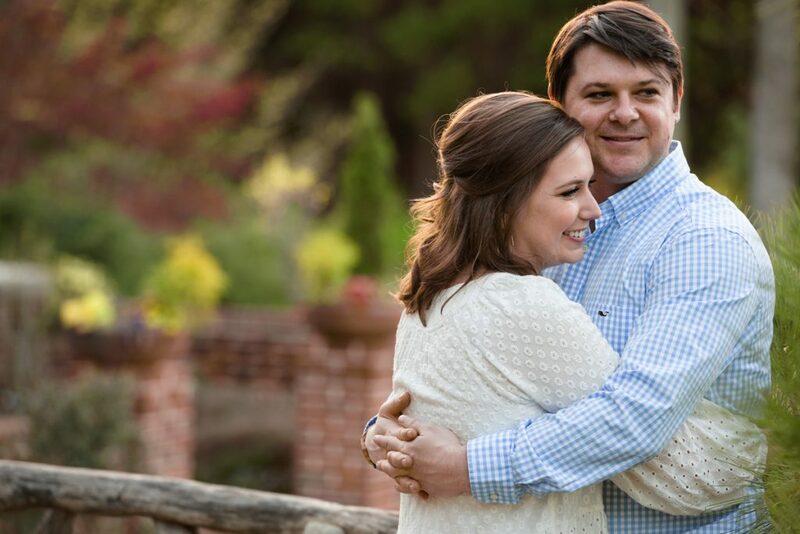 Be sure to check out Deb and Brett’s romantic sunset engagement session at the gorgeous Childress Vineyards HERE. Anne and Andrew met at a Christmas party. 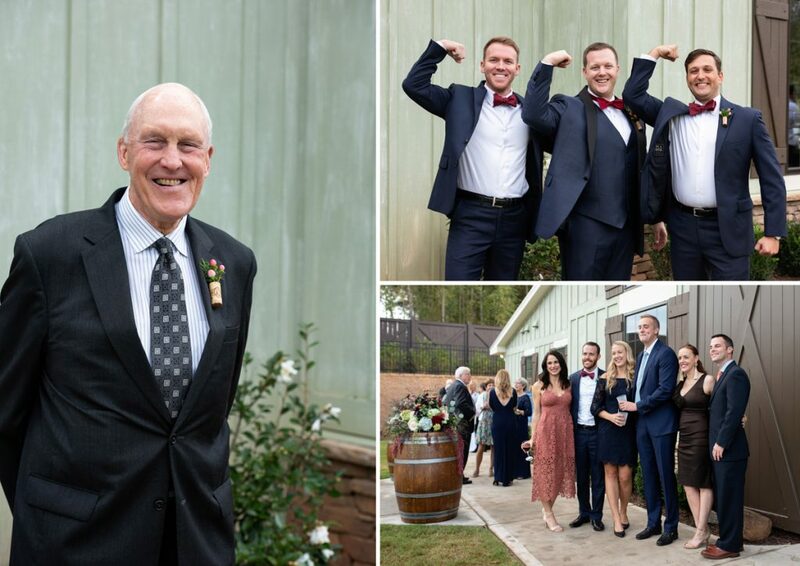 He hit on her, she gave him her number, and not too long afterward, Anne was saying “Yes!” when Andrew asked her to marry him—in front of a big MARRY ME sign spelled out in lights on the back fence. Everything these guys do feels so natural and genuine and intimate. Even their story makes you just want to giggle. Needless to say, I was thrilled to spend their wedding day with them. 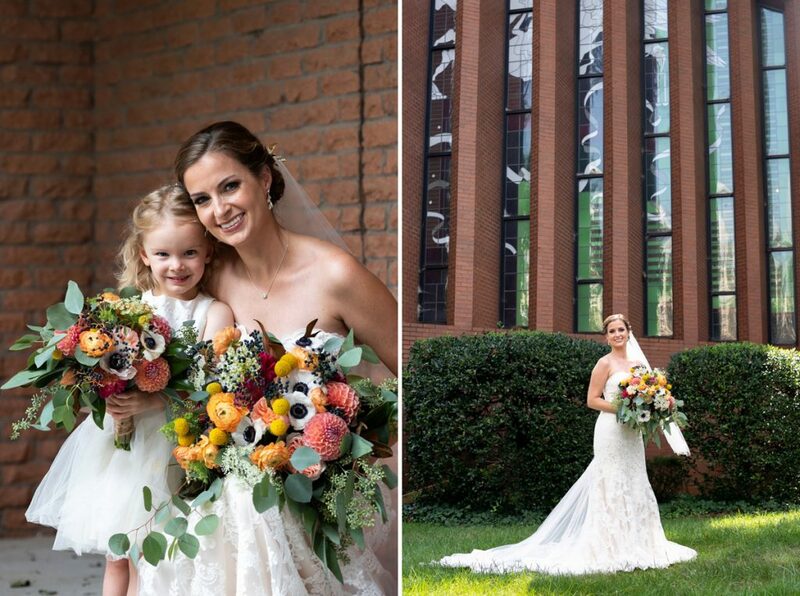 The wedding itself took place at Saint Gabriel Catholic Church. I have had the pleasure of working here on several occasions. I love this site for its beauty and versatility. 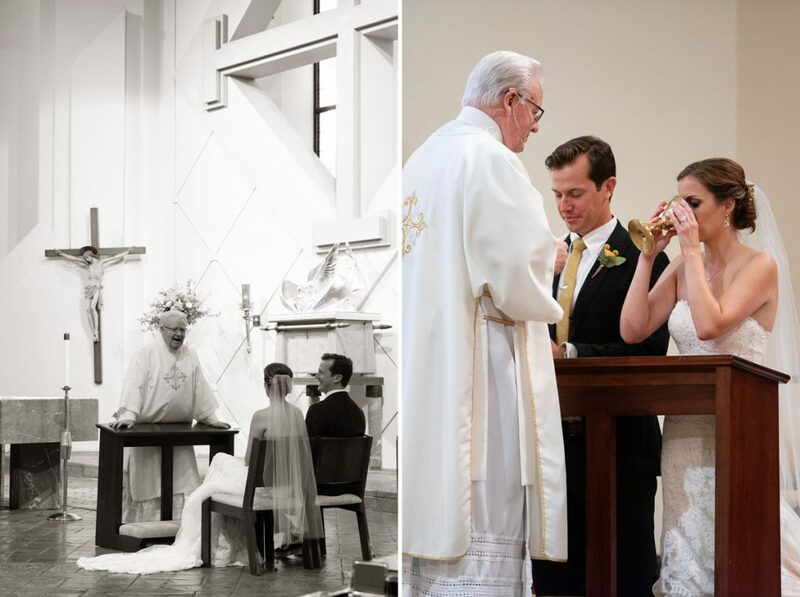 After the ceremony, which featured a full mass, a gospel choir—only Anne and Andrew knew about it—made its way down the aisle and escorted the bride and groom out to “Oh Happy Day.” As the congregation filed out of the church, the choir moved on to “Your Love Keeps Lifting Me Higher,” by Jackie Wilson. I was crying like a baby at this point, and people were dancing out the doors of the sanctuary. Can’t ask for more than that from an exit. 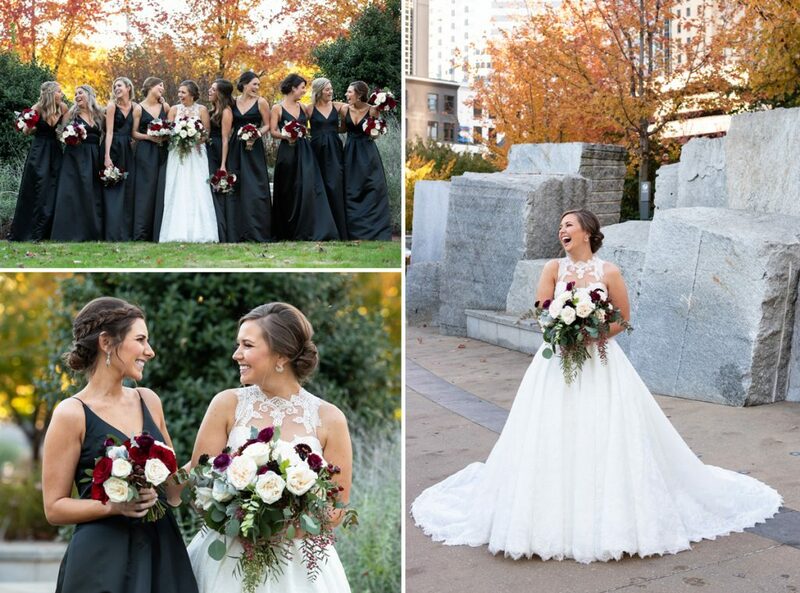 After the ceremony, I led the wedding party to Marshall Park in Uptown Charlotte for some post-ceremony portraits. 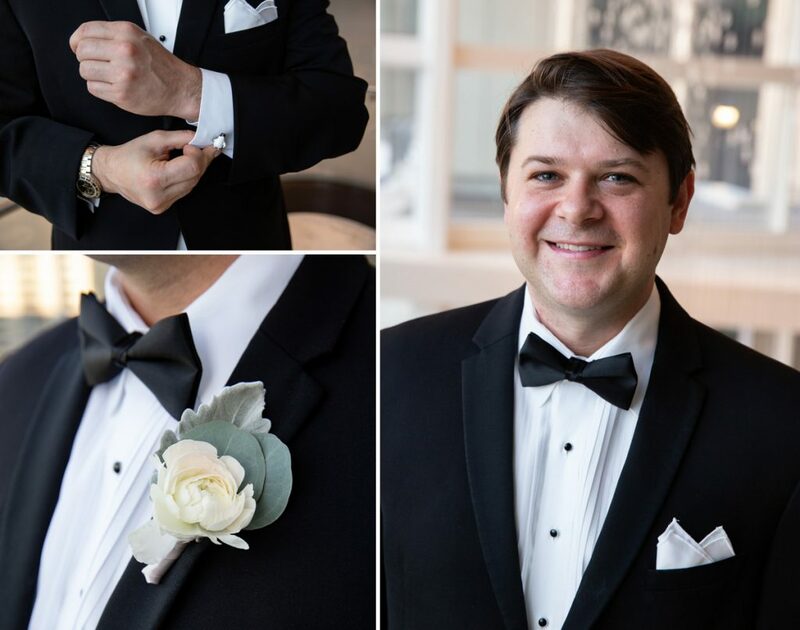 It was fantastic to have a variety of settings for the formals, and I adore the way they turned out. 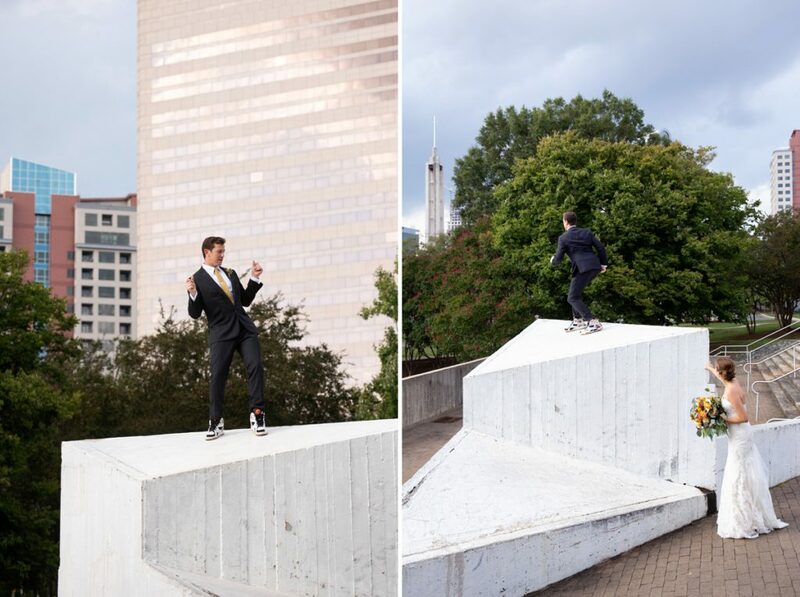 In particular, I was thrilled when Andrew busted out his vintage Reebok pumps (as he had promised he would) for some of the shots. 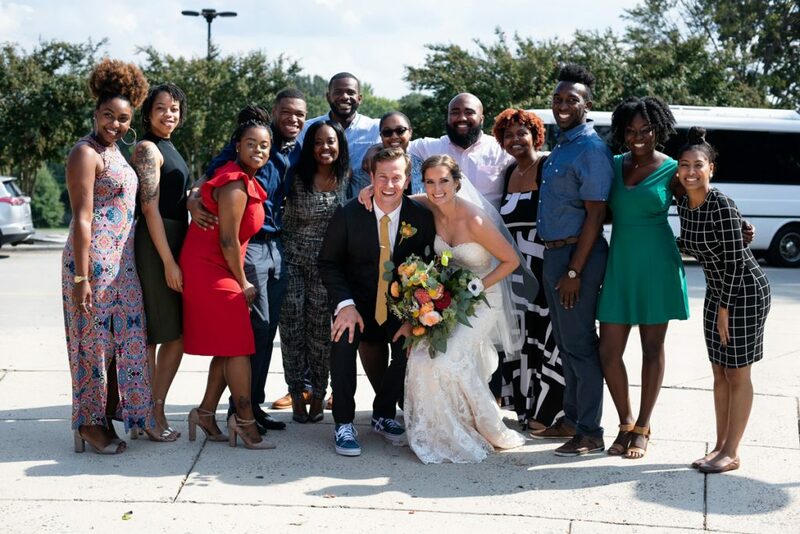 And I love the images of the entire wedding party on the steps that lead up to the neighboring courthouse, complete with a photobomb from the groom’s sister-in-law. 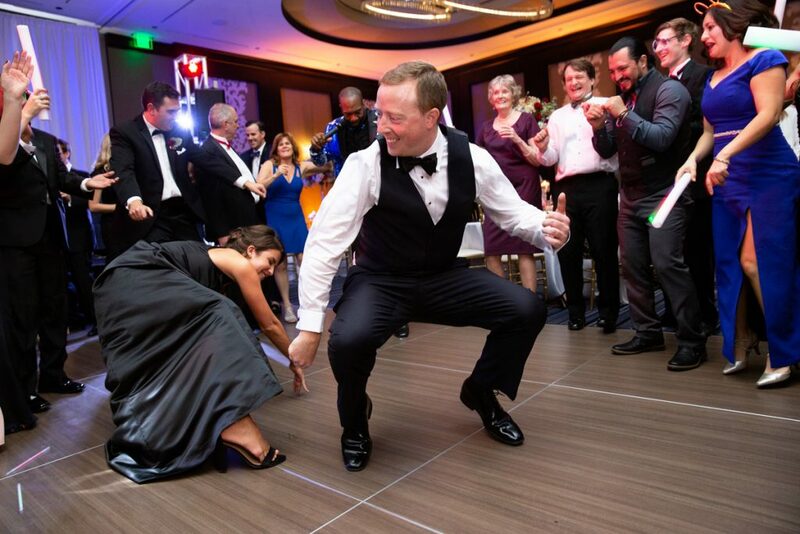 I later learned that this was payback for the groom’s similar behavior on her big day. It was perfect! 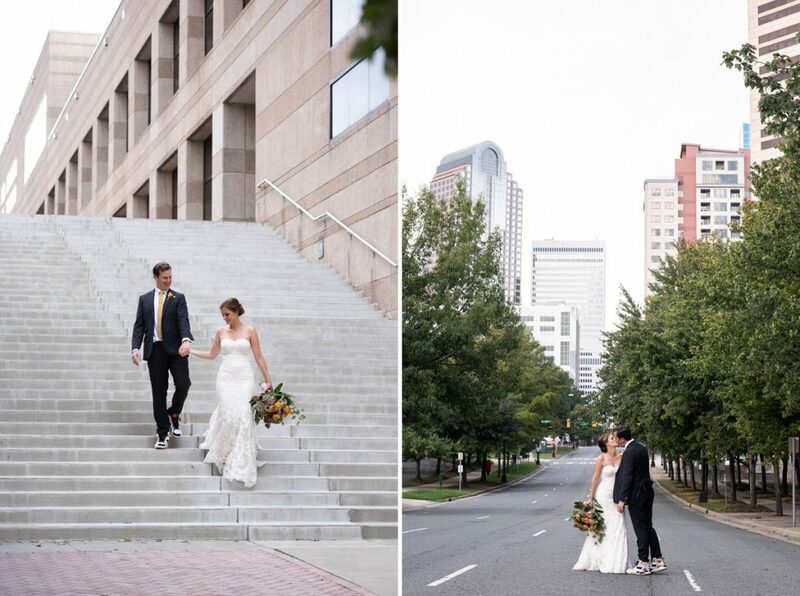 When we finished up at the park, we all trucked on over to the Palmer Building, another of my favorite venues in Charlotte. 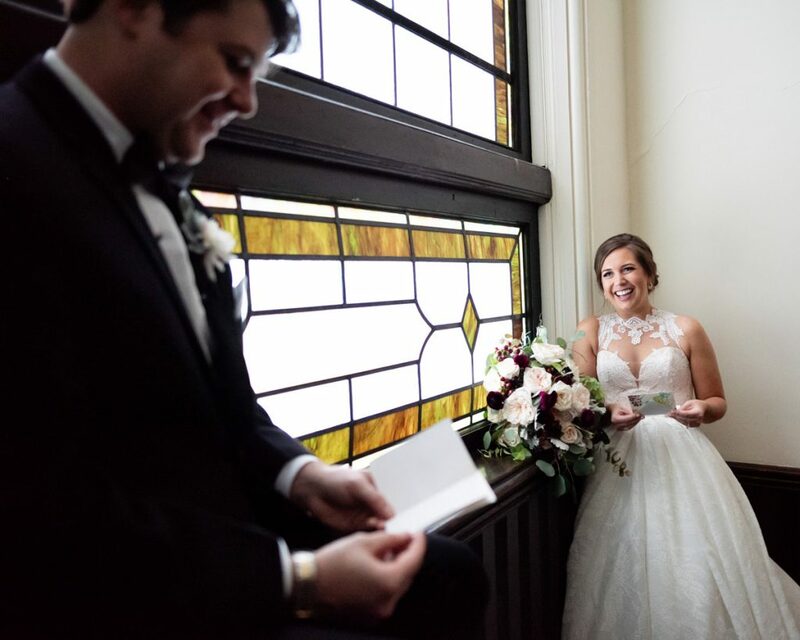 Anne and Andrew, both Catholics, loved the building’s connection to firefighters, so they were sold on the venue. Man, did they make it their own with about a million personal touches. 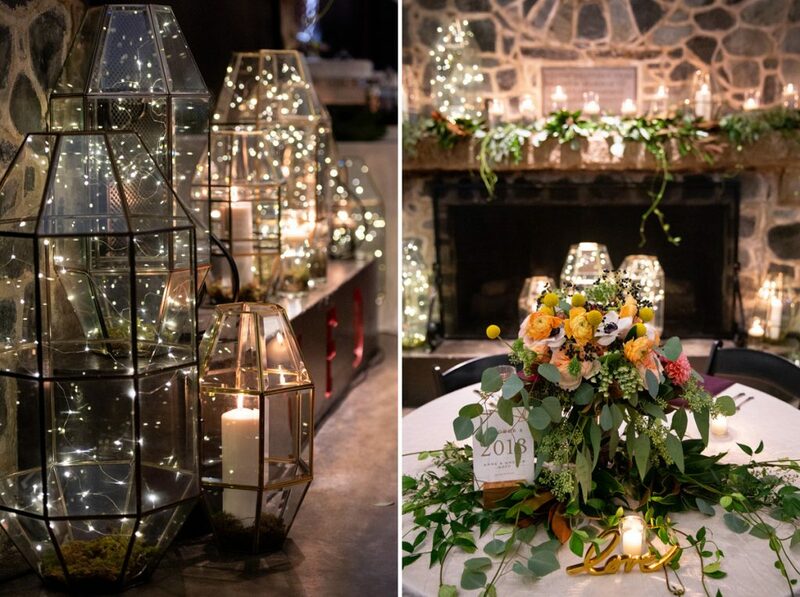 From the table numbers and framed family photos to the lanterns and reclaimed light fixtures, Anne and Andrew brought all of who they are into the decorating. 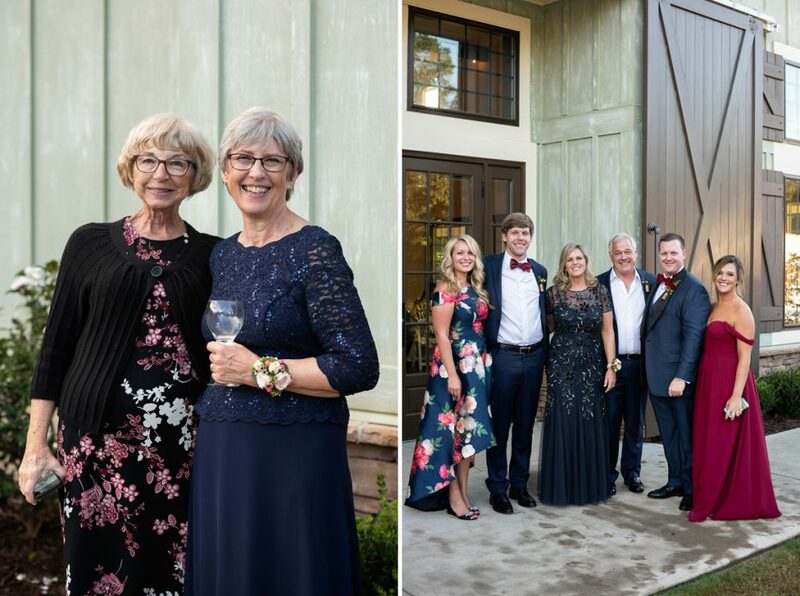 Anne described their décor at the wedding as kind of a bohemian romantic look with a mid-century modern twist—I loved every bit of it, and I think she’s dead on. The arrangements from The Flower Diva were lush and organic. 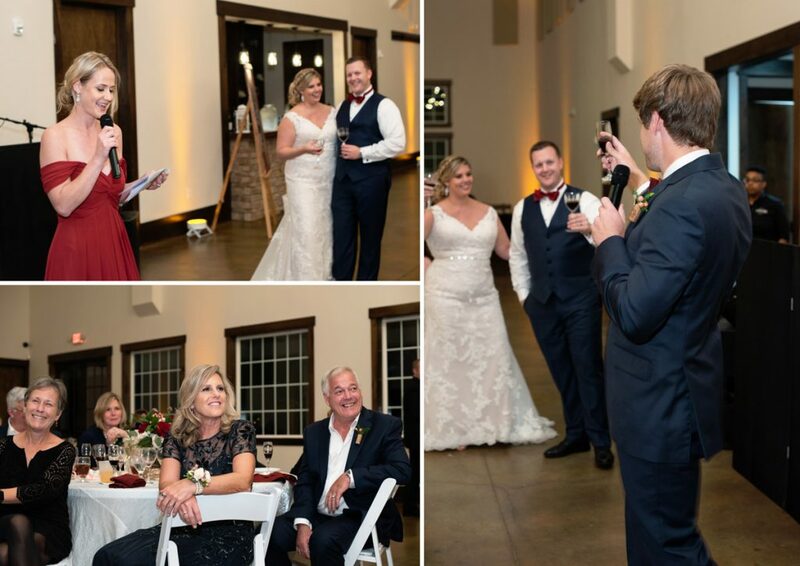 I thought the picture frames were a particularly sweet touch—each frame contained a wedding photo of an admired couple from one of their families. Pretty cute. 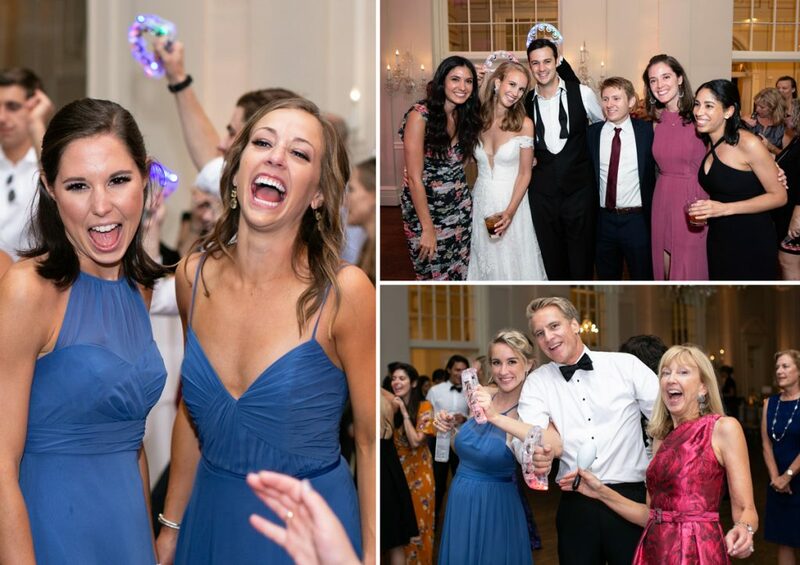 And the nostalgic vibe went along perfectly with the song to which Anne and Andrew danced their first dance: Orange Colored Sky, by Nat King Cole. The food—which was absolutely delicious, especially the cobbler bar—was created by Best Impressions Catering, and the music was provided by the always fantastic Spintastic Sounds. 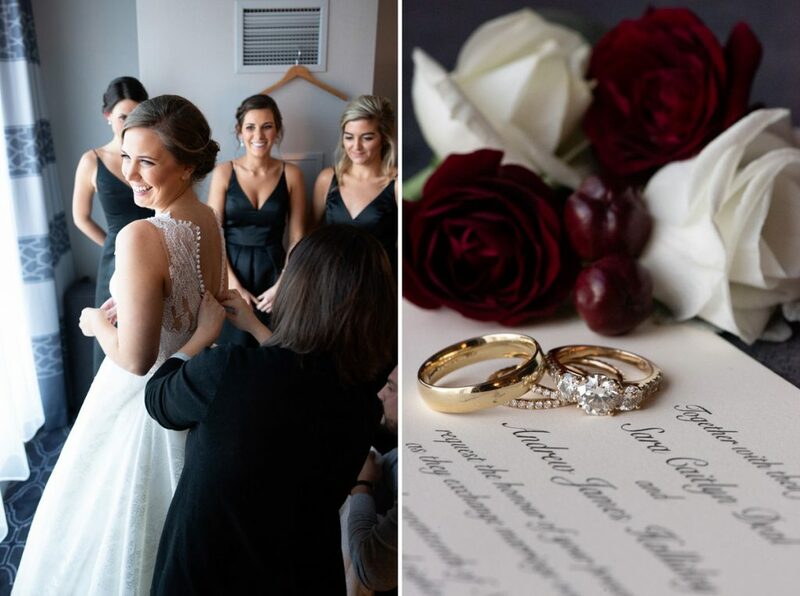 All in all, it was a truly individualized event, one full of the kinds of personal touches and genuine feeling that make a wedding impossible to forget. 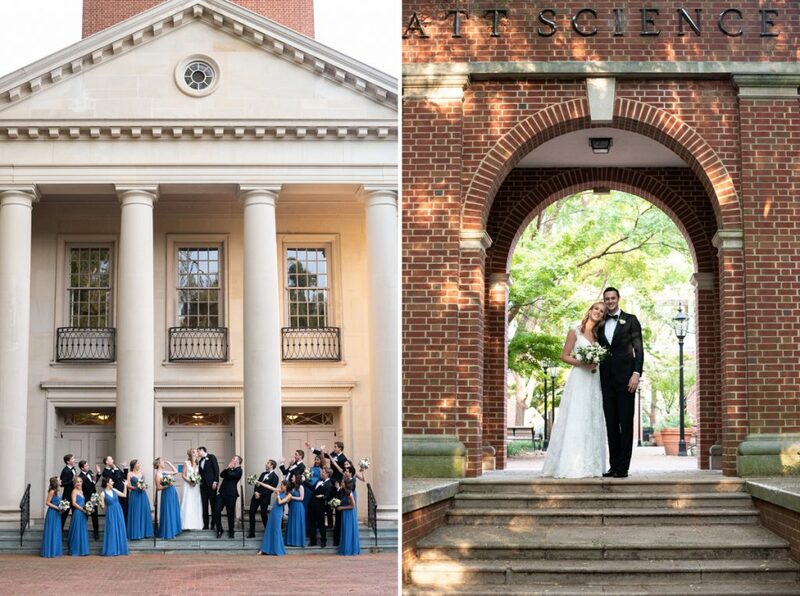 After the wedding, Anne and Andrew headed off to Asheville for a couple of days, and they have plans to continue their honeymoon a few months from now in Barbados. 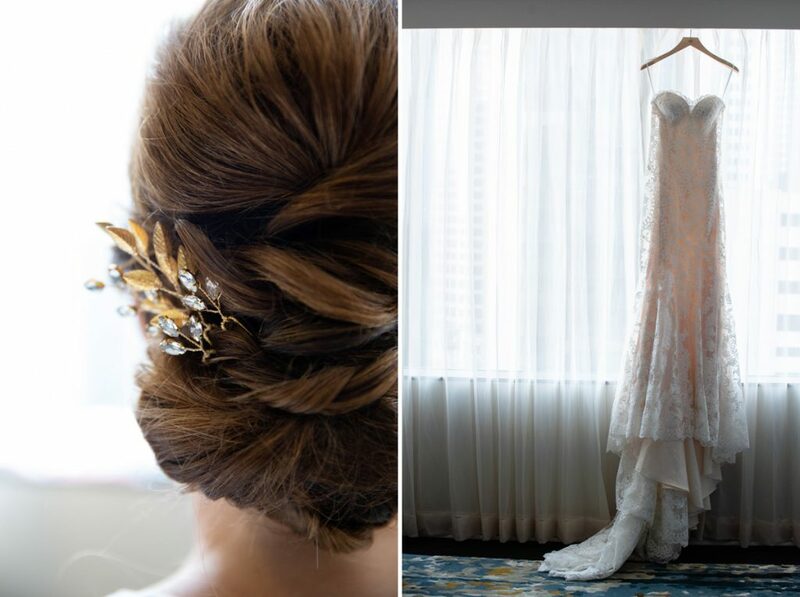 Thank you to my second photographer, Emily, for her beautiful images! 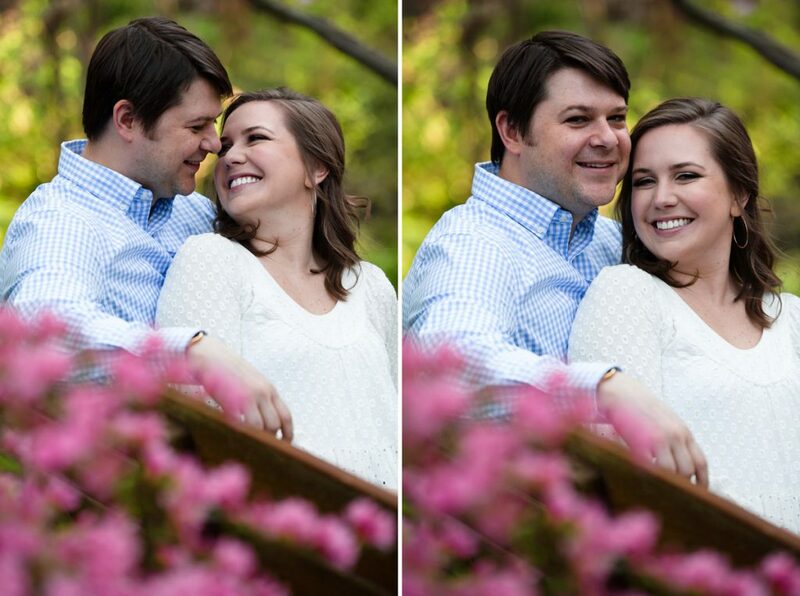 To see images from Anne & Andrew’s engagement session, which took place at 3 different Charlotte locations, click HERE. 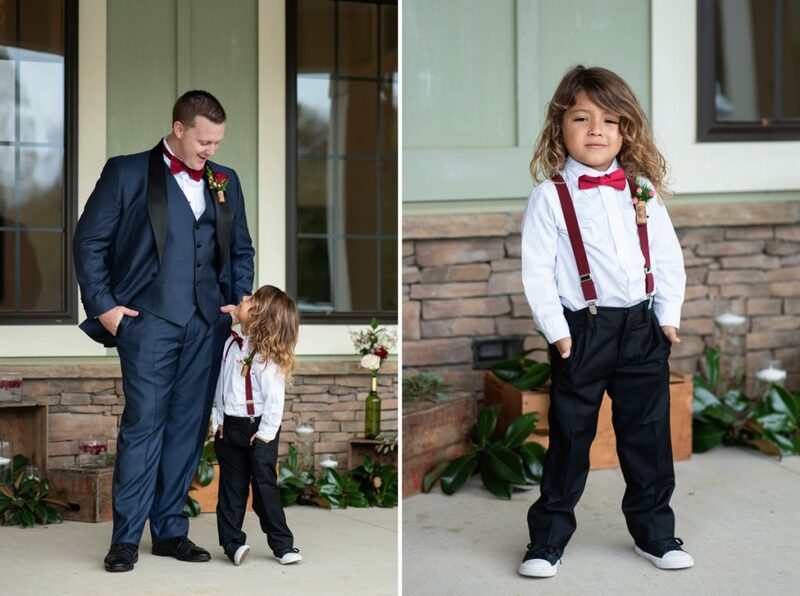 You have to see the adorable shots with their sweet pup, Goonie! 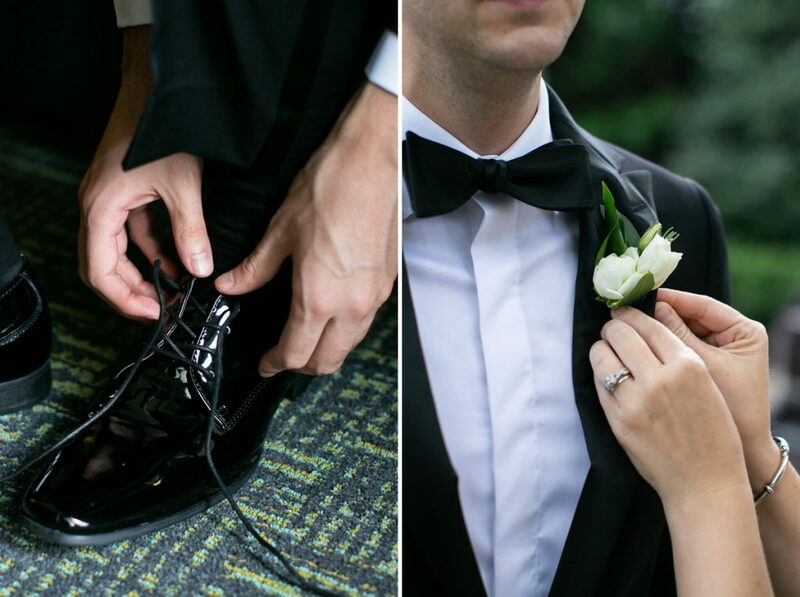 Sara Caitlyn and Andrew met in the most organic of ways, through mutual friends. After deciding that Sara Caitlyn might be someone he’d like to get to know, Andrew asked her out. They spent their first date at Thomas Street Tavern, a spot my own husband and I know well from our dating days. They had a great time and immediately planned a second date. Relationships dynamics are funny things. Some people are looking for a partner who will indulge their every whim. And then there are people like Sara Caitlyn. Part of what she liked so much about Andrew was that he had his own wants and desires; she understood that this was a relationship where she might not always get things her own way, and that actually drew her to Andrew. Andrew found himself attracted to Sara Caitlyn’s unique laugh. Every time he heard it, the sound put a smile on his face. 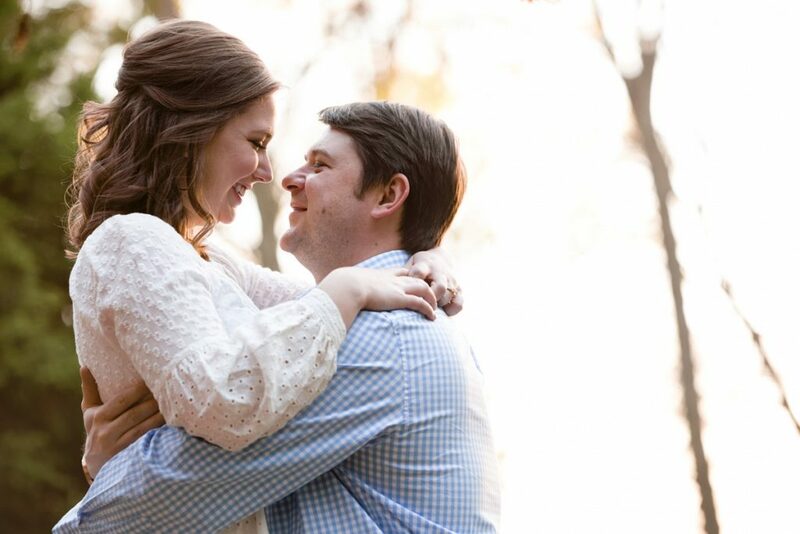 As their relationship matured, Sara Caitlyn and Andrew discovered a mutual love of traveling. They took any chance to plan a quick weekend getaway to the beach or to the mountains. Failing that, they indulged their mutual love for the Panthers, attending as many games as they could. Andrew proposed on New Year’s Eve. They had plans to go out that night, so they were spending a lazy day at home, just relaxing. Andrew called Sarah Caitlyn into the kitchen, and when she arrived he dropped to one knee and popped the question. 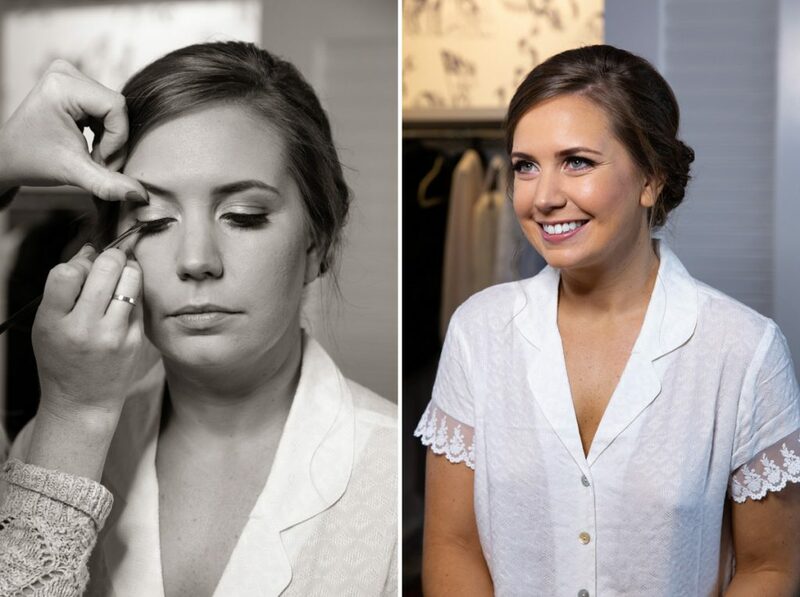 It was simple and intimate, just what Sara Caitlyn had always hoped for. The ring was one that Andrew had chosen entirely on his own. They hadn’t really discussed rings before, so Andrew was flying purely on instruments. That’s part of what I like so much about these two. It’s a partnership of two people who are full and complete individuals, but who make the most wonderfully complimentary pair. After Sara Caitlyn and Andrew reached out to me, I met Sara Caitlyn and her mom Kelly at Central Coffee for our initial meeting. My home office was in the throes of a massive remodel, so the offsite meeting spot was a nice change. I remember how smitten I was with Sara Caitlyn. 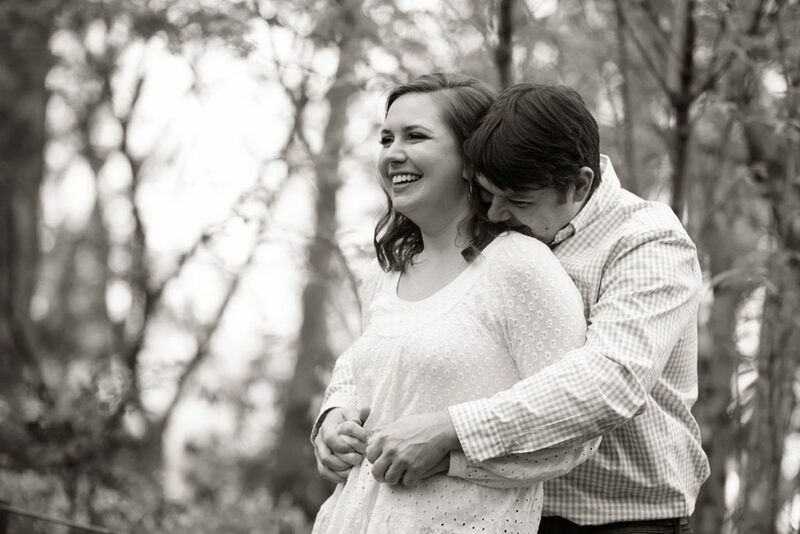 Her love for Andrew was so obvious, and I couldn’t wait to get them in front of my camera. 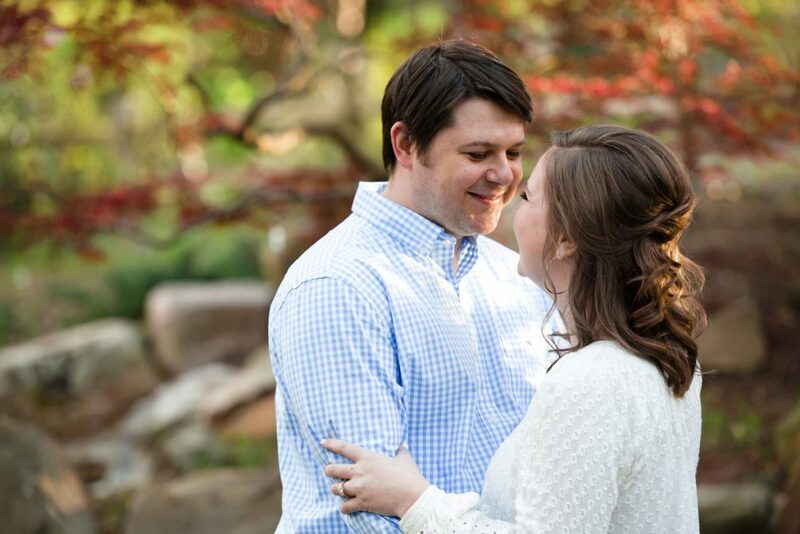 We made plans to do the engagement shoot at the UNCC Botanical Gardens. The shoot took place in late March, so the flowers were just starting to bloom, and the whole place was green from all the Spring rain. There were some lovely shots around the Japanese maples—I don’t know if there’s a prettier color than that initial red of a maple leaf. Sara Caitlyn and Andrew were loving and adorable; I felt so happy to have the chance to spend the afternoon with them. I can’t wait to see these two tie the knot in just a few hours. I know it will be a day to remember. Krista and Drew met at a birthday party, danced their hearts out that night, and then went on a first date initiated by the line: “Do you like food?” Not too long after, Drew was proposing with Krista’s grandmother’s ring in New York, and just a bit after that, I was meeting them over a Skype chat. I thought they were adorable, and thankfully, they liked me too. Before the wedding even got started, I was treated to the beautiful surroundings of Krista’s family home. The house in Davidson, about two-and-a-half blocks from the church, and was built in 1901 as a dwelling for the clergy of the church. 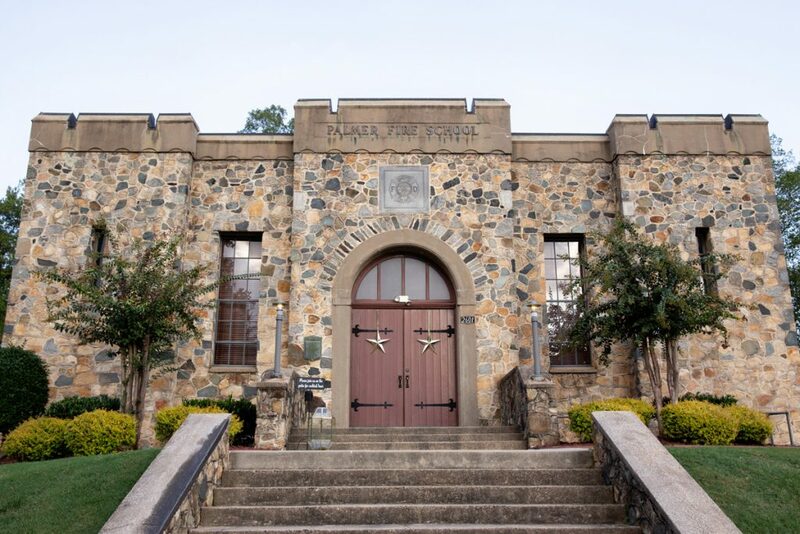 The home is on the National Register of Historic Places, so you can imagine the flawlessness of its details. 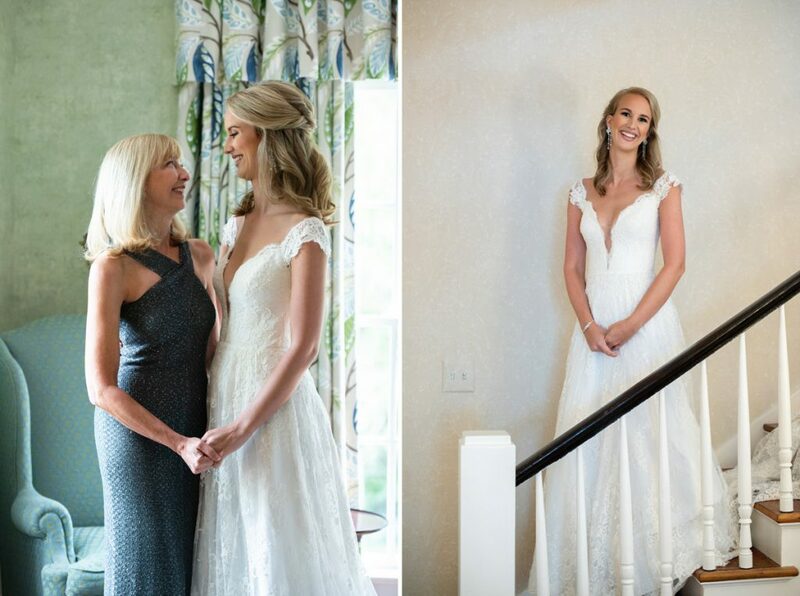 It was such a magnificent place to shoot our getting-ready images, and it also provided the backdrop for Krista’s first looks with both her dad and Drew, which she did at the house back-to-back. 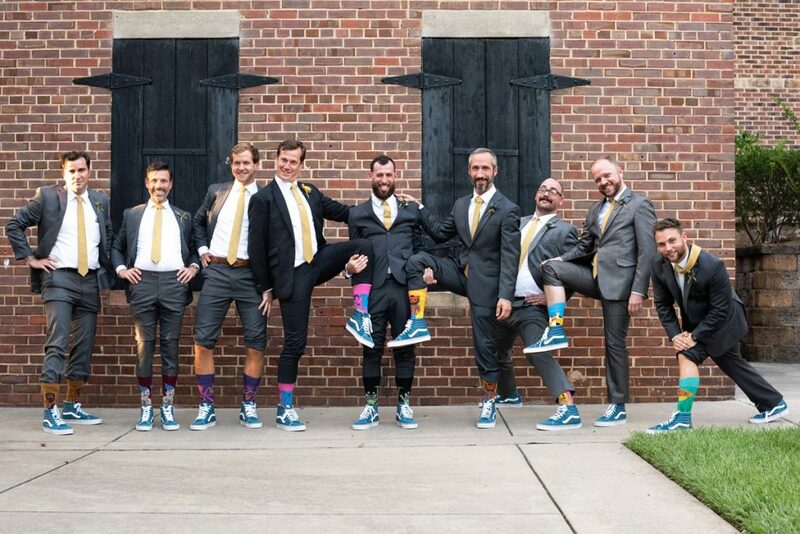 Once we got those shots, all of us—including the bridesmaids, groomsmen, parents, and flower girls—walked over to the church. Along the way, we paused on the campus grounds for some romantics of Krista and Drew, and to take some of our pre-ceremony portraits or the wedding party. 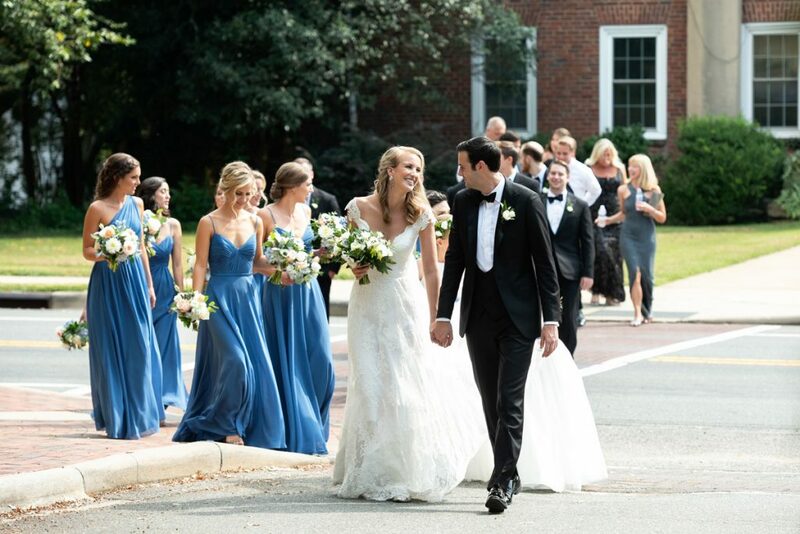 The wedding took place at Davidson College Presbyterian Church. I’ve photographed weddings there before, but it’s been an age, and I’d forgotten how lovely it was. 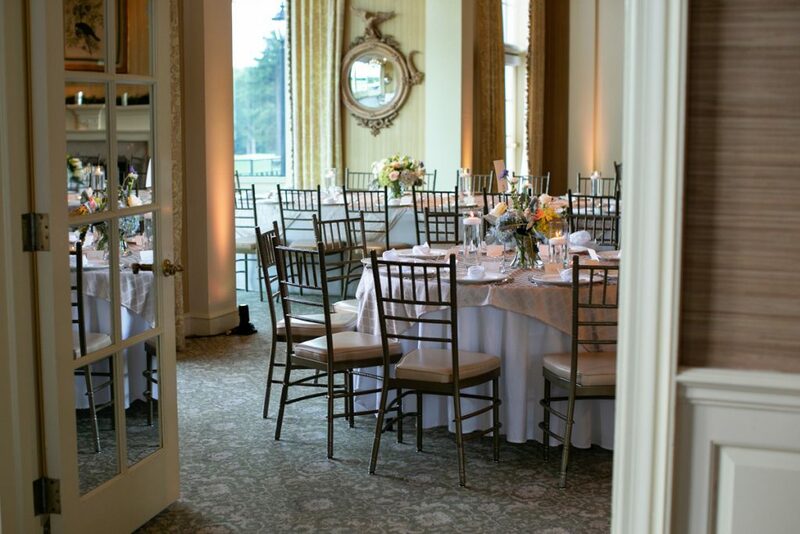 After the ceremony, the party headed down to Charlotte Country Club, one of my very favorite venues. Not only is the club beautiful to look at, it’s also just so well run by one of the nicest crews anywhere in town. Before the official beginning of the reception, everyone enjoyed a sunset cocktail hour on the event lawn, one of their newest spaces. It was a perfect September evening, and the late day light was fantastic. Toward the end of the hour, Krista and Drew descended the spiral staircase and spent some time with their guests. 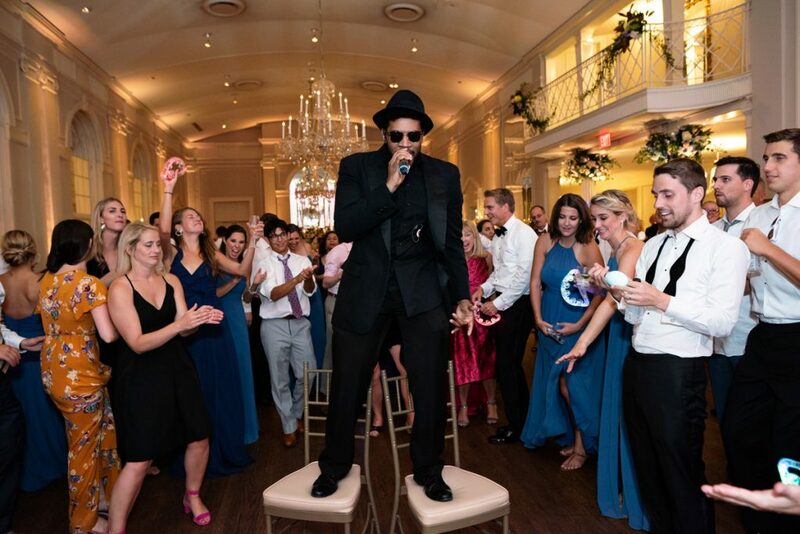 There were so many great elements that made the reception a killer party. One was the photo booth provided by Smile Laugh Share. The guests had a ball with that. 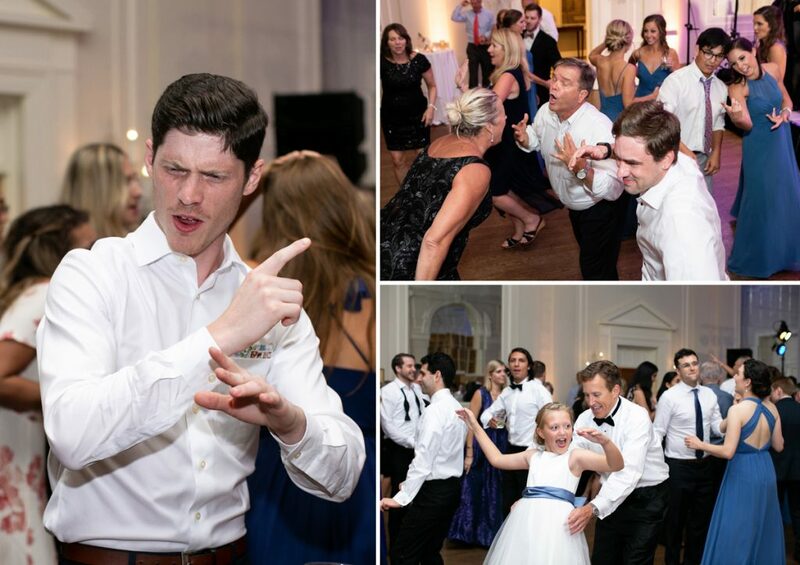 Another was the fact that the band was Sol Fusion, arguably the best wedding band in town. What I really loved the most was watching the bride and groom. I hope it comes across in the pictures, but there was such a pureness to the love and respect Krista and Drew feel for one another. I kept noticing how Krista’s eyes would just go soft every time she looked at Drew, like this man was everything she’d ever wanted. These two are just so well matched. When it came time for the exit, I was touched to see that there were little bags of cookies for guests to take home. The previous Christmas Eve, I had sent Krista and Drew—and my other upcoming wedding couples—cookies from the Appalachia Cookie Company. 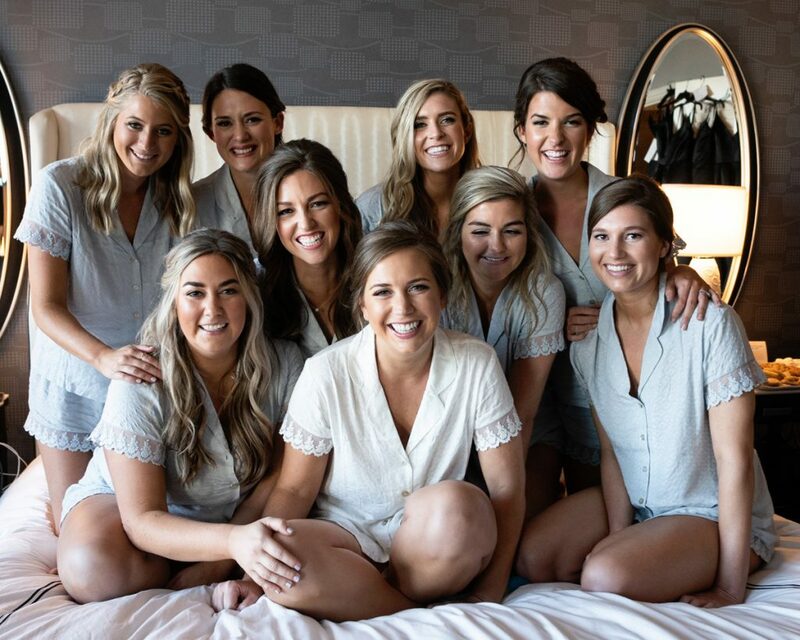 They liked the cookies so much that they ordered hundreds of them as wedding favors. I love when things work out that way. The exit itself was a shower of rose petals. 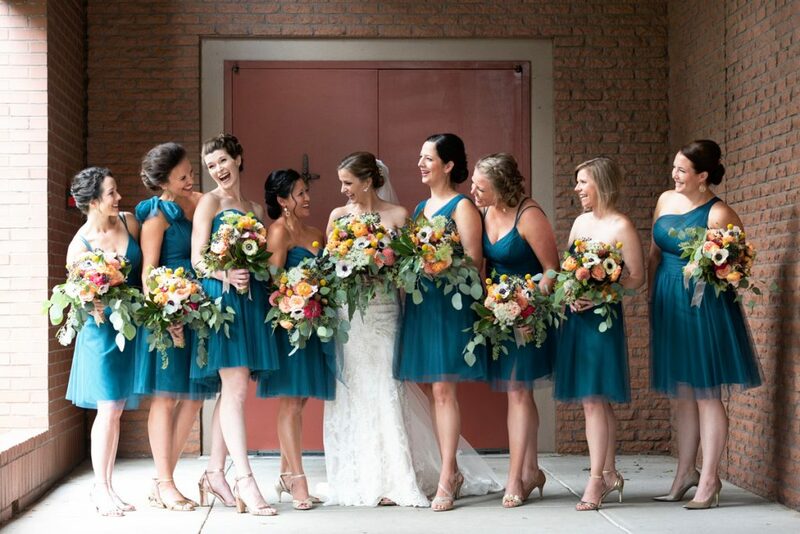 The guests lined up out in front of the club as Krista changed into her going away dress. 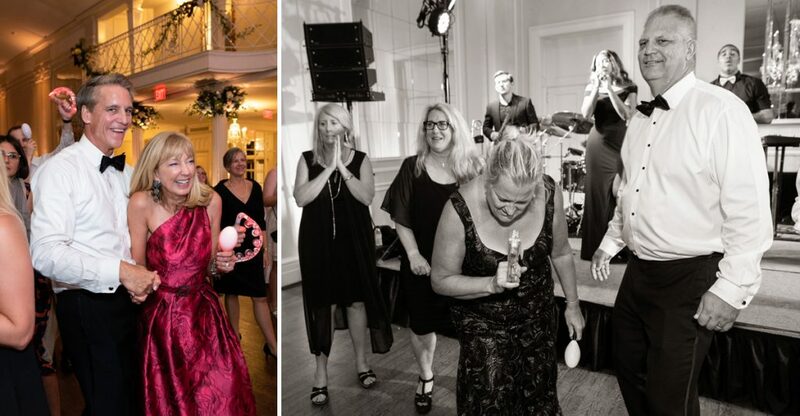 Each guest grabbed a fistful of petals in one hand and a cookie in the other and then showered the couple as they made their escape into a new, wedded life. I’m so happy for these two, and I can’t wait to see what life holds for them. Thank you to my second photographer, Laura, for her beautiful images. 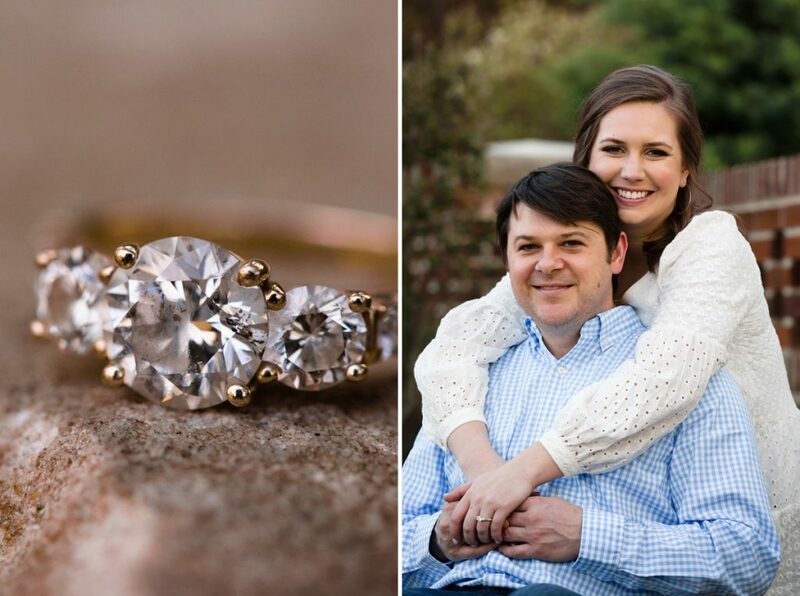 Click HERE to see images from Krista & Drew’s romantic engagement session at the Sarah P. Duke Gardens on the campus of Duke University.